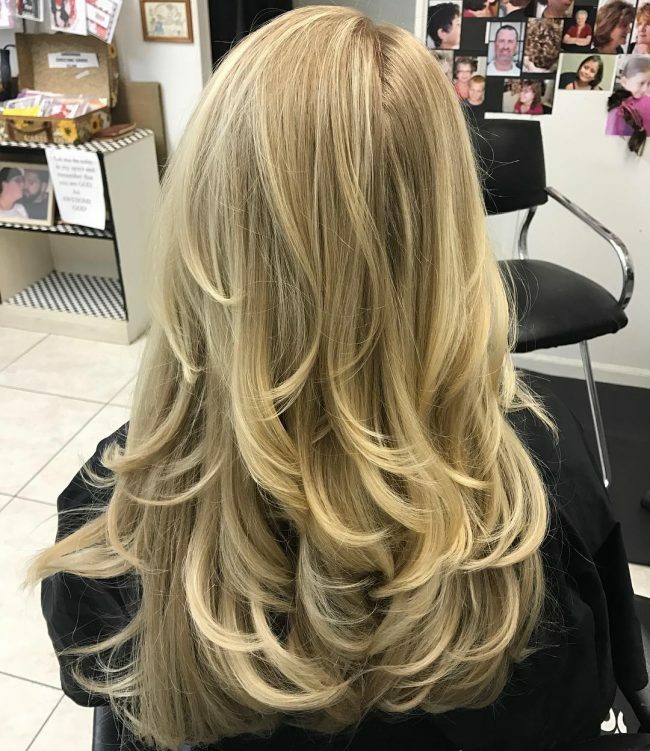 Beautiful long layered hairstyles will always give you an elegant and stylish look. But in most cases, it’s not about layering the hair, it’s more about how creative you’re to pull out your dramatic appearances. Also, you don’t have to go far expensive, just create something simple and fun-looking. 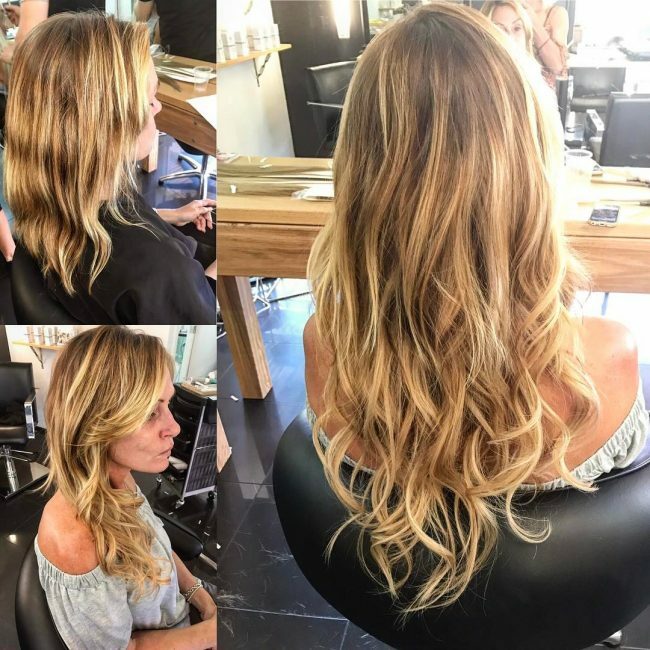 You can also take a simple style, inject lots of fun and flavor to it, and then come up with an awesome layered hairdo as seen in these pictures. When you’re styling your hair, it’s always good to have a goal. This hairstyle needs goal-oriented women who mostly aim for a sleek, and chic texture. Such women also strive to get a shine all over their layered haircut. Speaking of layers, these one are quite long and perfected. You can use this hairstyle to spice up your looks. 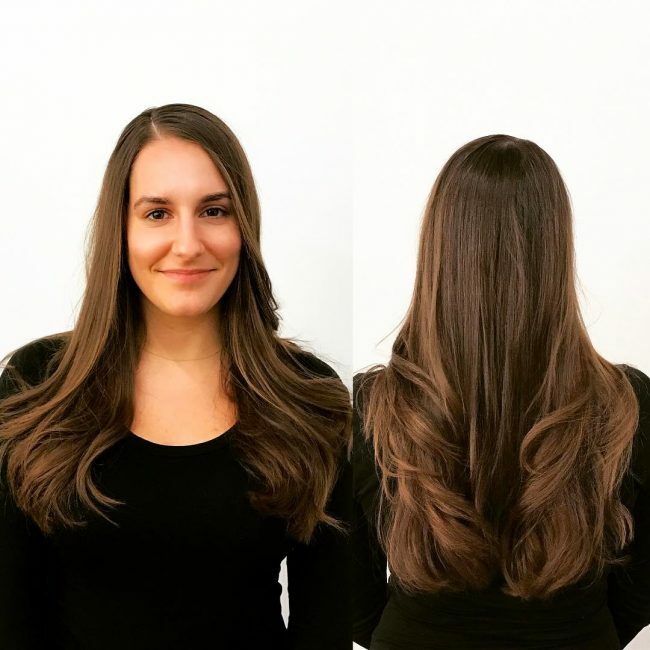 Are you worried about chopping off those layers even an inch? This hairstyle is a great transitional cut, especially if your intention is to come up with an awesome shape. The best thing is that you are not only going to get a shape, but you're also going to receive a surprising attention grabber. 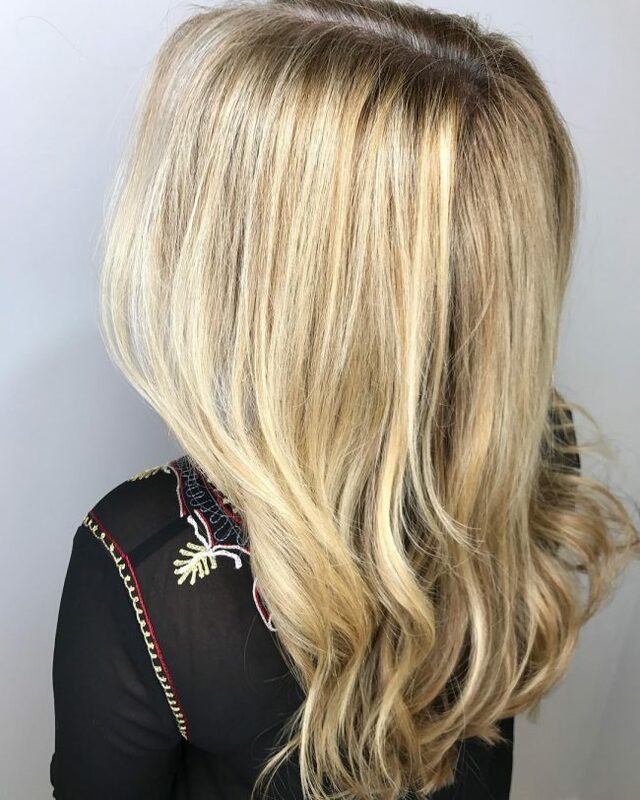 Of course, everyone will love watching your blonde highlighted layers. Here comes one of the most popular hairstyles for long-haired girls. 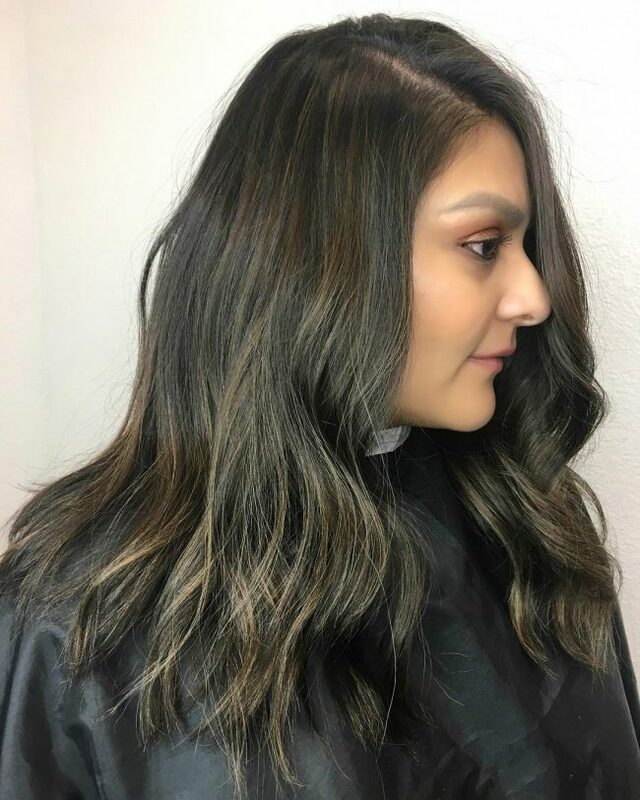 No matter what the texture is, both colors and the longer layers blends to create one of the most flattering hairstyles. 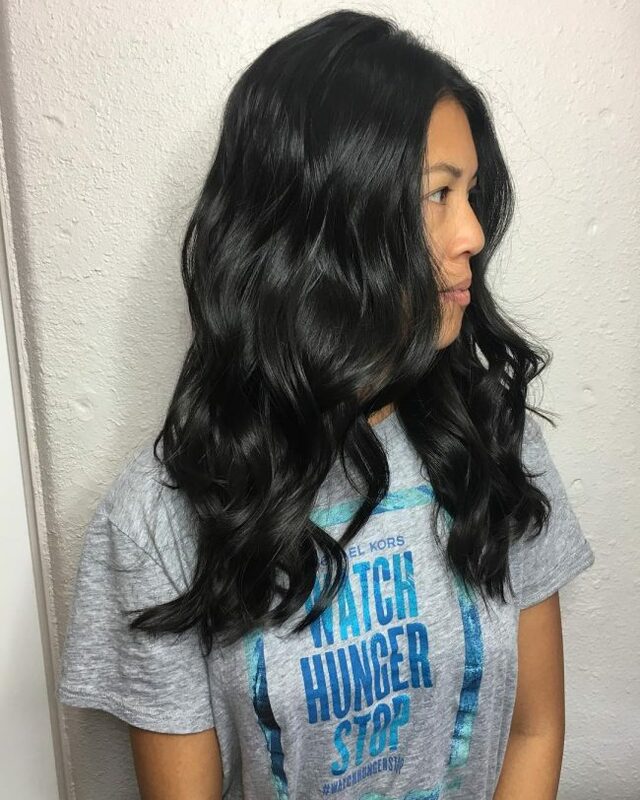 Waves create lots of drama into any layered hair as seen in this hairstyle. 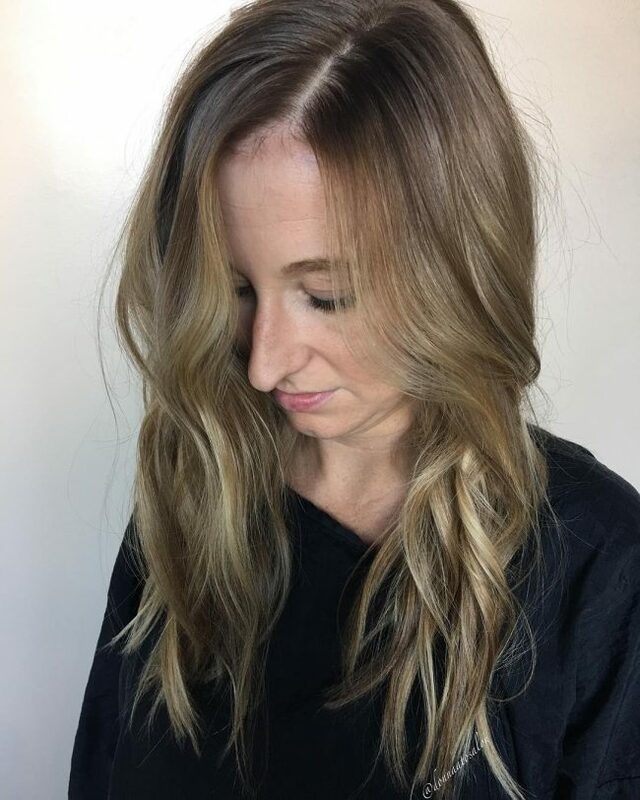 But rather than settling on them alone, that's why we include the flavor of honey blonde colors to take the style one notch higher. This one is a real layered hairstyle you should take as far as you're looking for a hairstyle that frames the face. It seems that this girl has mastered her styling game. Despite creating a fringe that hangs past the eyebrows, she also starts her layers past the chin. Now we've got the specific ultimate goal for all trendy woman looking to spruce up their looks. Notably, not that these trendy women want to do much with their hair, just to create sleek, chic layers. Finally, they are going to color it with baby lights to look precisely as seen in this hairstyle. By the way, a cut would be necessary to provide some body and movement. Does this hairstyle look like it would give you a killing appeal? Well, if yes, remember that most of the ingredients that add up to the entire hairstyle are layers. Just take a note of how they cascade down these girl's face to frame it. If you were the one wearing it, you would either smile like her or just let out a cracking laughter. 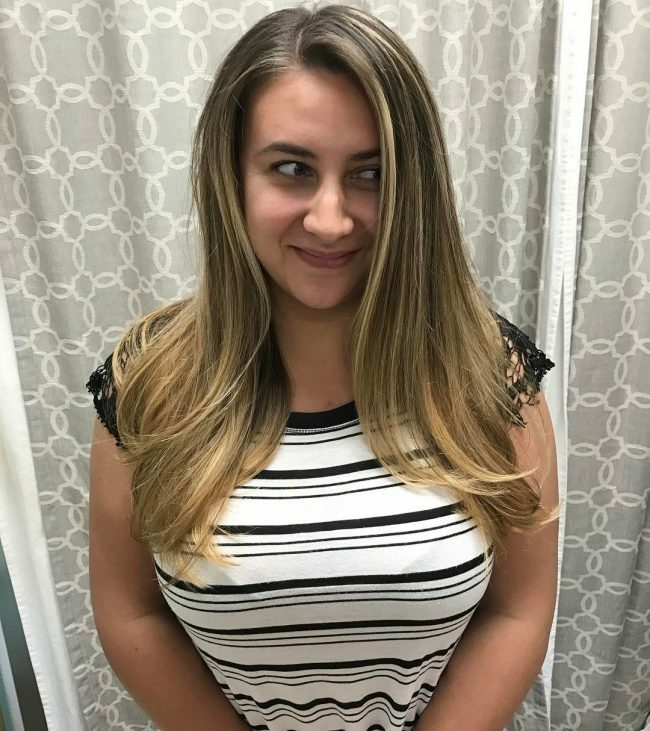 The layers in this hairstyle don't seem to appear at the top. Perhaps it's this girl's trick to conceal her beauty. But maybe not, because as the hair moves down, they seamlessly blend in, and she continues to make them pronounced on the curled edges. What about the colors? Perfect to stop any traffic on your way. 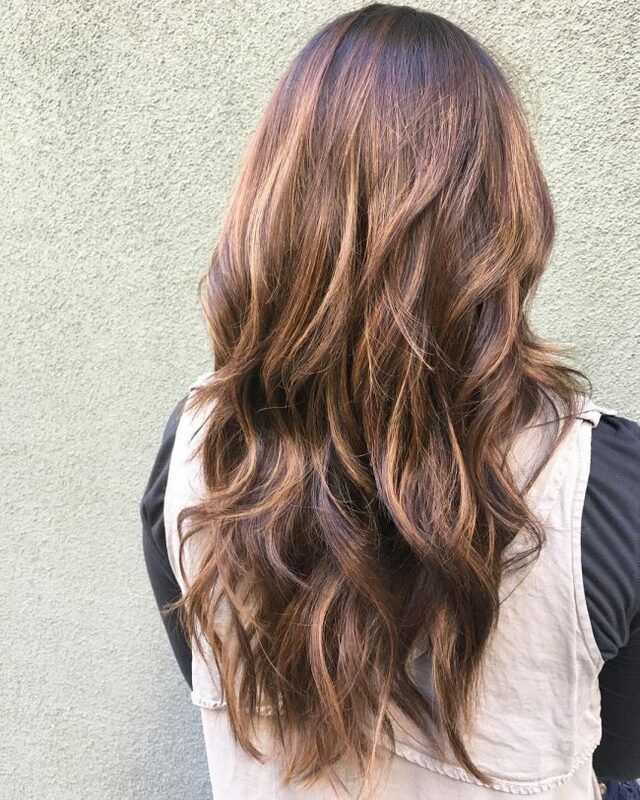 This one is a perfect hairstyle for anyone who doesn’t feel like losing too much length of hair, and also prefers the glamor of layers. Apart from that, it also prefers someone who wants a simple hairstyle that you can take to both formal or casual occasion. If you want the same look, you would as well avoid using too bright colors. Black can do better. 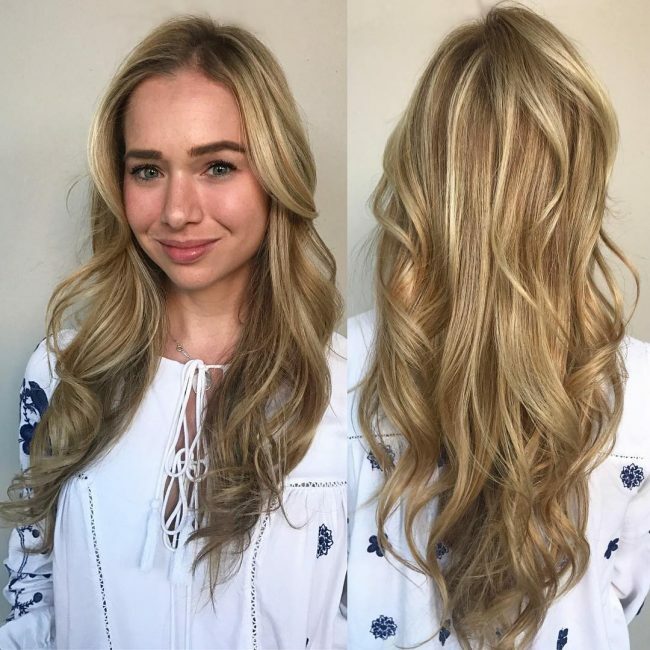 Do you love long layered hairstyles? 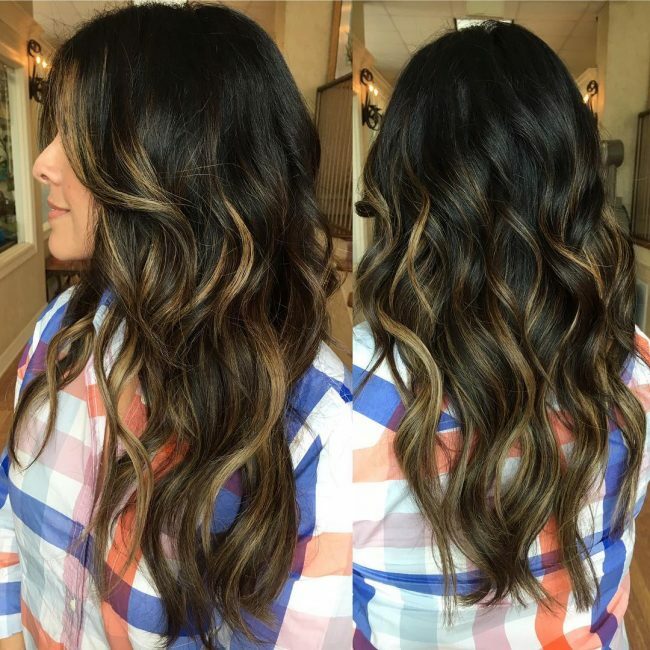 Sure, then we suggest you try this layered hair featuring balayage ombre shades. It's a unique hairstyle, and it will always look complicated to any uneducated eye. Look at how the layers settle smoothly. Evidently, the style feels so natural than forced. Plus, the colors blend so well with the curls. 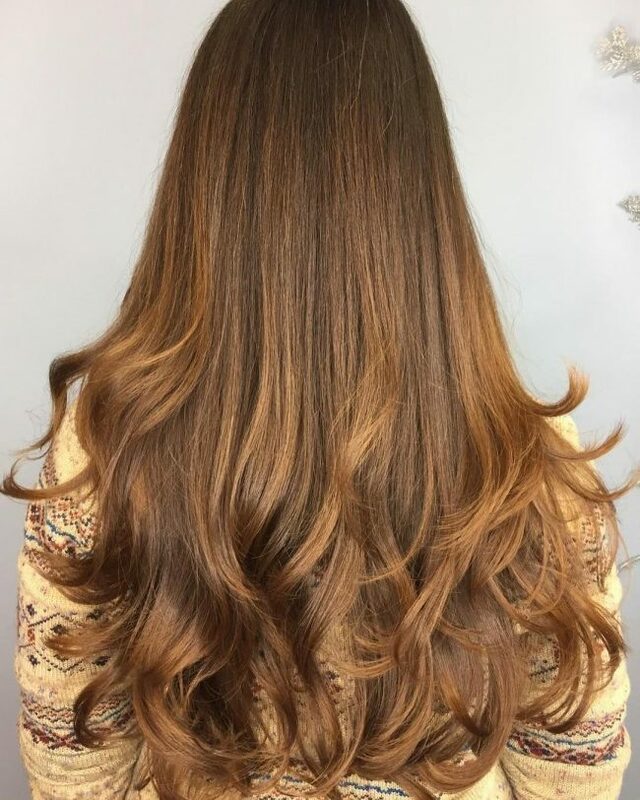 Even this one gives us every reason to create layers in the hair? Before we forget, so it's possible to create some layers curving towards the chin to embrace it? 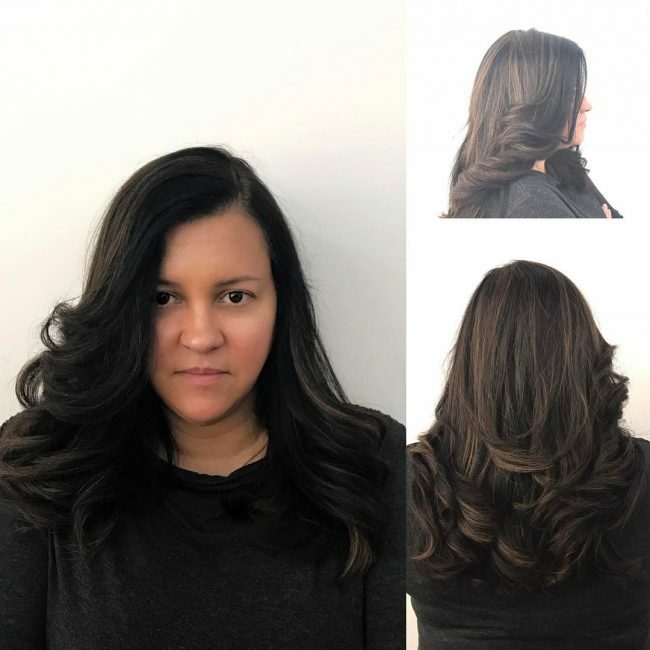 It's the secrets of creating varying lengths with layers to embrace the face, something you couldn't achieve with a standard hairstyle. Create this hairstyle if you want to show your friends a miracle job. 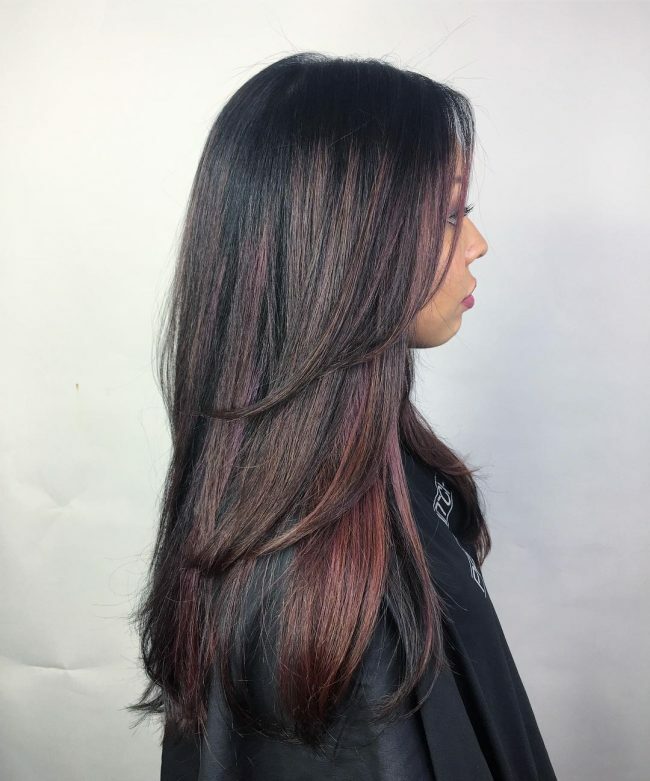 Color melting is another technique you can bring to your hair to always look exceptional. How would you feel when you know that in a way, you have something unique and everyone can see it? That's the exact feeling that this hair comes with. 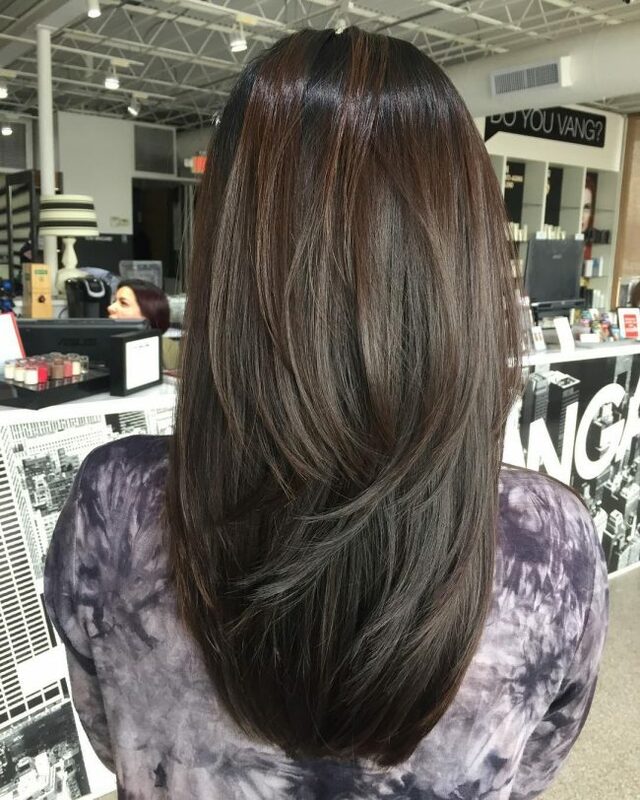 Create it with dark brown color on the roots, and then melt it to light brown on the ends. Leave the rest to your layered Locks. You got to see this. It's one of the most flattering hairdos for long haired women. Its secrets rest within color, layers, cut, and waves. As you can see, the combination of waves and the cut help in creating dimensional layers. Then the color solution creates a superb color melt from dark roots the lighter edges to bring the rest of the drama. 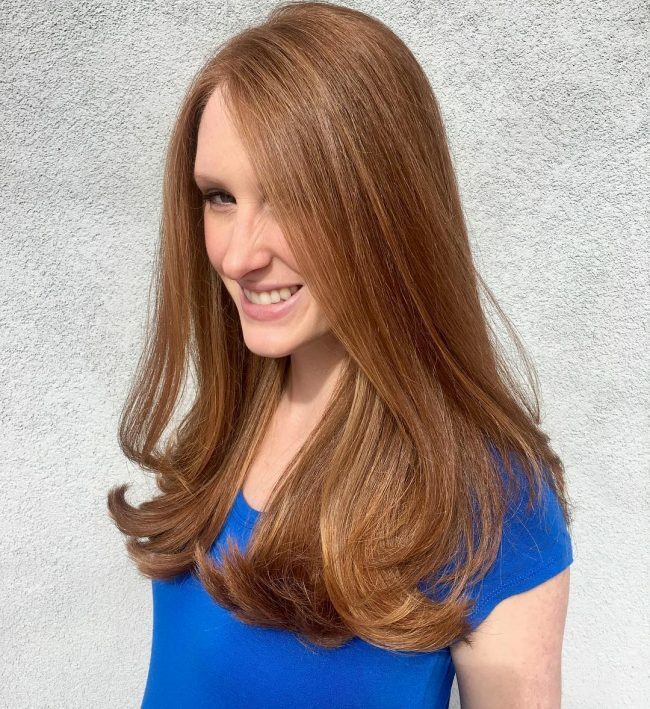 Start talking about glamor from smooth red hair because that's what this hairstyle is about to give you. 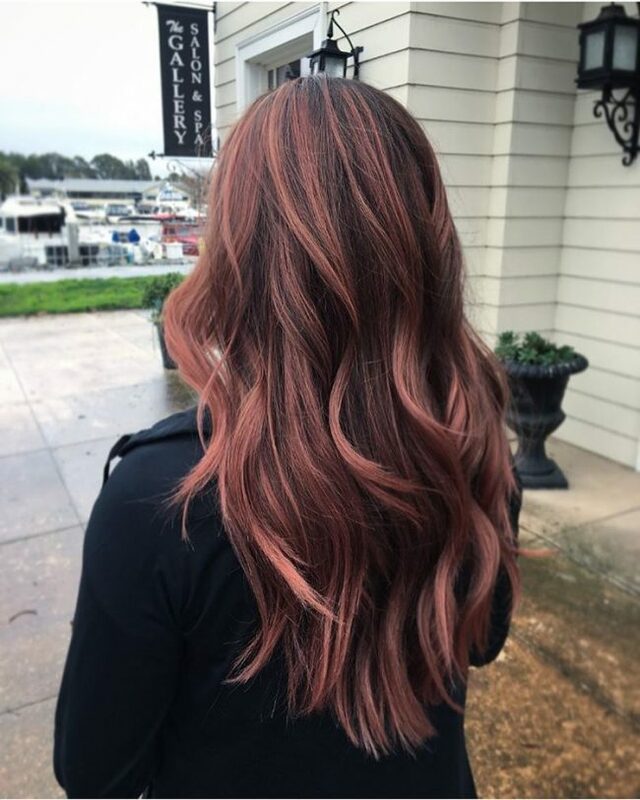 You'll need super smooth thick hair, and then the elegance of reddish shade like copper. 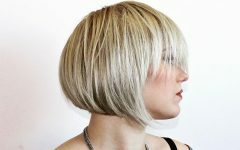 Both the hair tone and the thick strands will blend well, but you would need to create some layers for a top-notch effect. 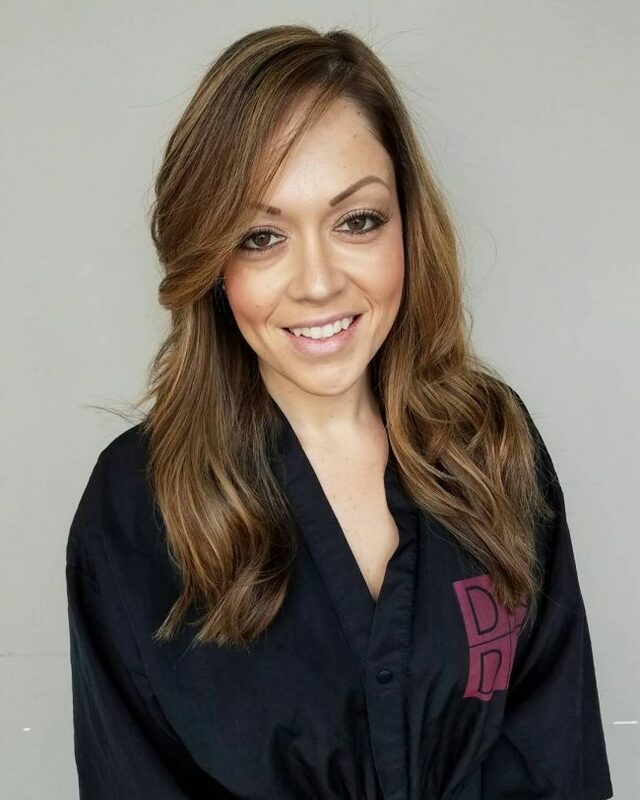 Make a call to your salon and tell everyone to prepare different barrel sizes because you're not leaving until you achieve the exact voluminous hairdo. 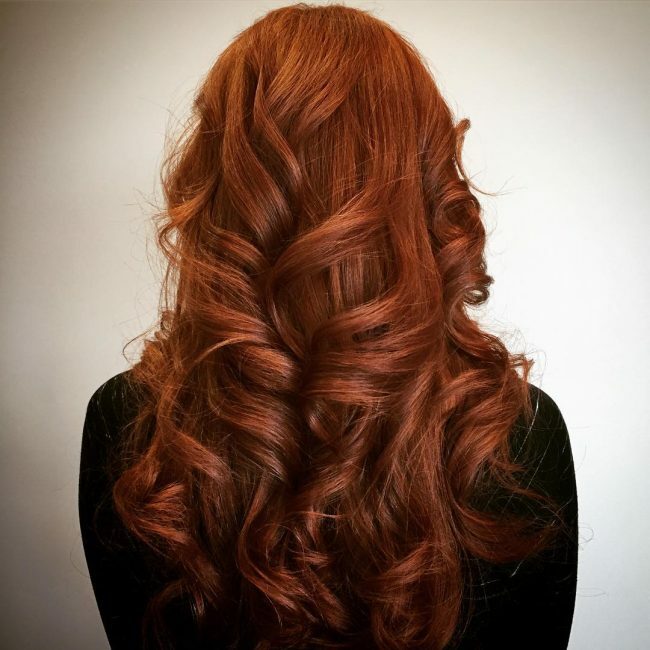 This means you'll be creating these curls that would lead to the exact layers. Apart from that, you'll also bring in the power of blonde highlights. We were still going to need a side swept hair after all. This way, you can use this hairstyle to interchange with another classy style to always give off an elegant appeal. 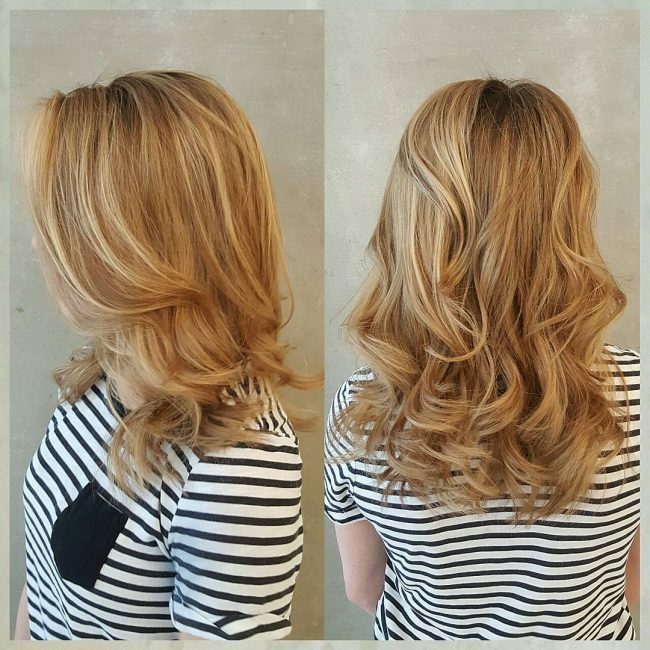 With this side-swept layered 'do, your locks will look amazing without any attempt to show the impression of an overdone hair. For a super touch, create waves cascading down your back. 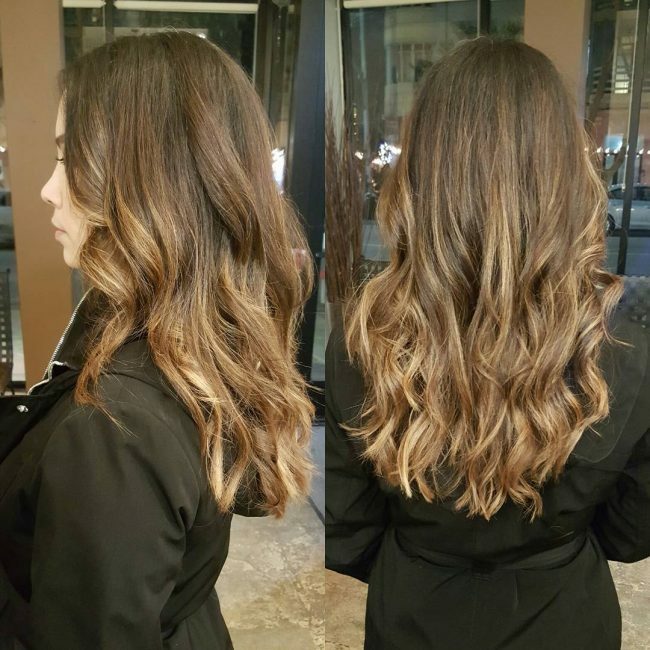 You'll also need a touch of balayage highlights to make your hair stand out. But there is one more thing that you'll need to give your style a real accent. We are talking of the elegance that comes with layers. So while creating the waves, make sure they'll lead to subtle layers. After that, you can rest assured that all your outfits are charming. Always combine waves and layers because the two work hand in hand. 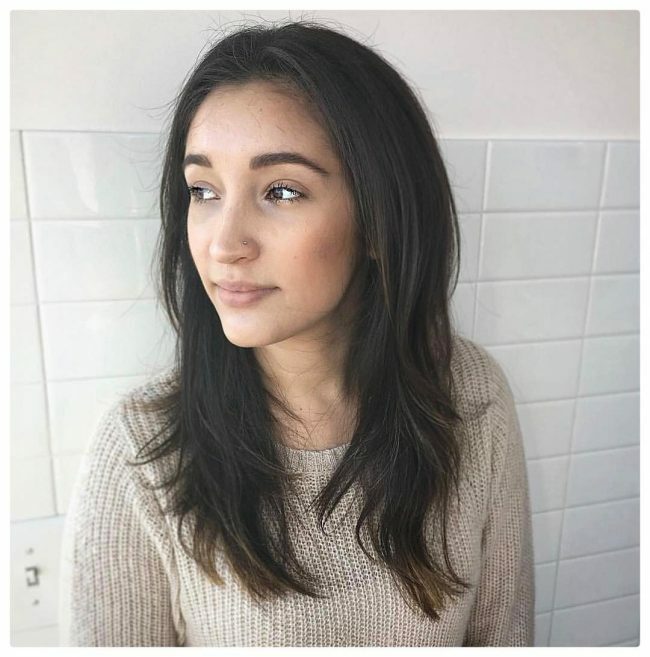 And since both of them help in creating an accent with your hair, layers are a bonus you should get each time you're styling your hair with waves. After both are in place, come then adding the flavor of colors. Make sure to go for bold colors as far as you want a bold statement. That's why this hairdo looks so cute without a blemish. 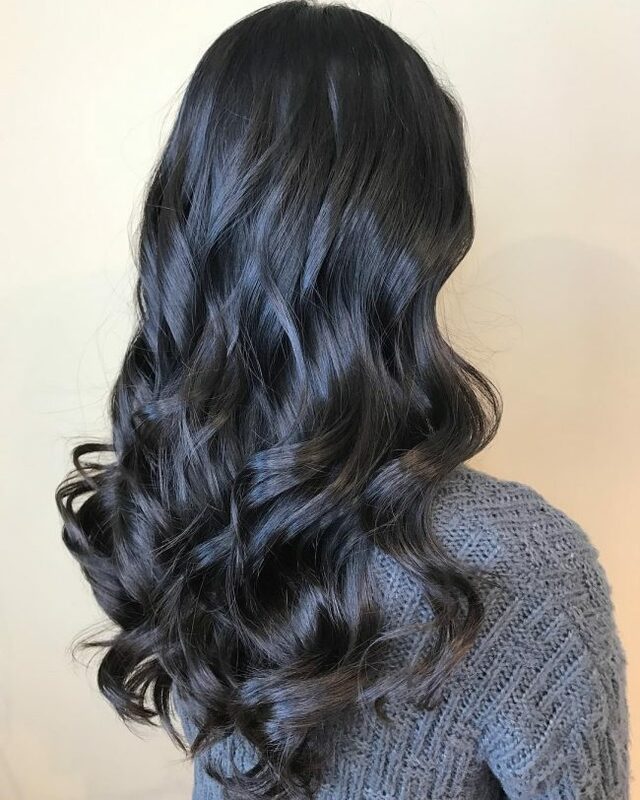 Is it the waves, or it's the dark colors that make this hairstyle look so captivating? But maybe it's the edgy, jagged layers. If you get confused on what makes this hairstyle a statement, you just stop thinking about the individual features and start being concerned with setting an appointment with your stylist.Tell your salonist to create everything as it is. That's the only way you can give this hairstyle its own sense of movement. 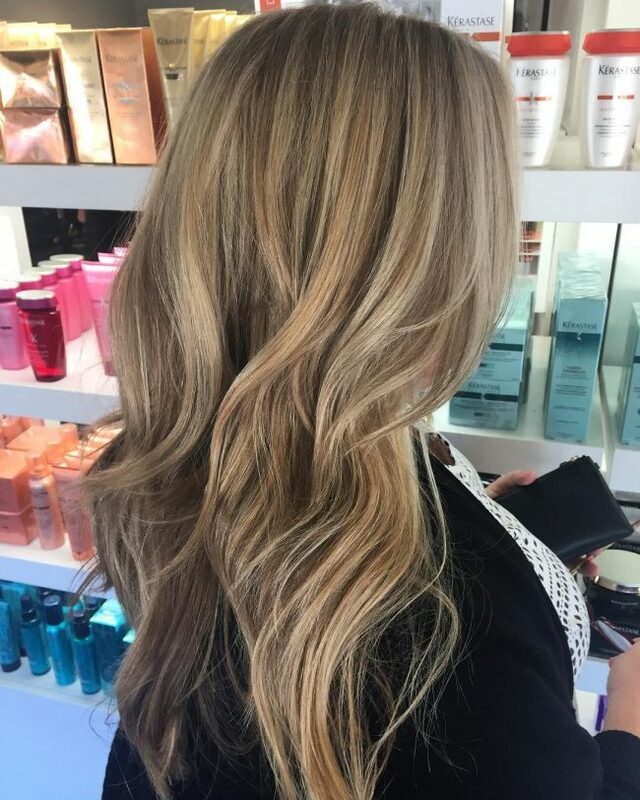 The subtle warm blonde highlights in this hairstyle create a beautiful dimensional color. 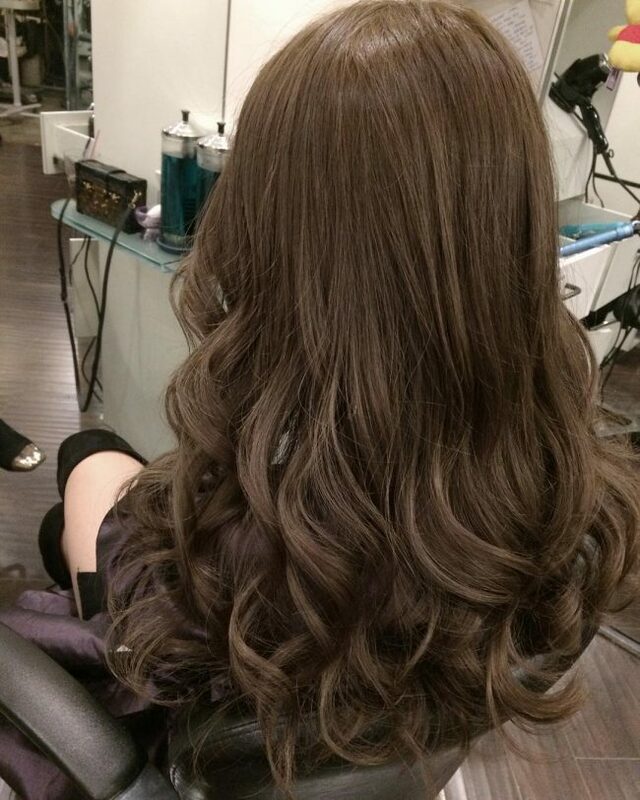 The entire hairstyle looks professionally done, with the layers falling softly on each other. 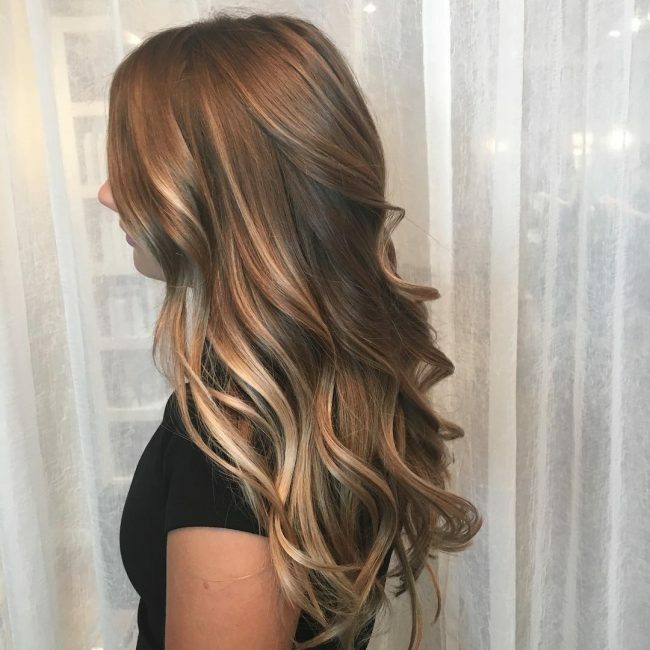 Apart from that, the color transition from the roots to the ends creates the exact effect that you would need for your party. Take this hairstyle to make any dull party live. Layers turn out to be the easiest ways to come up with a smashing look. You can go for either short, medium, or even go wild with long ones throughout your length. One thing you need to know is that creating layers makes your style a bit more sensational. By the way, that was a bonus tip. Multiple layers come with movement, and they are also fun to style. 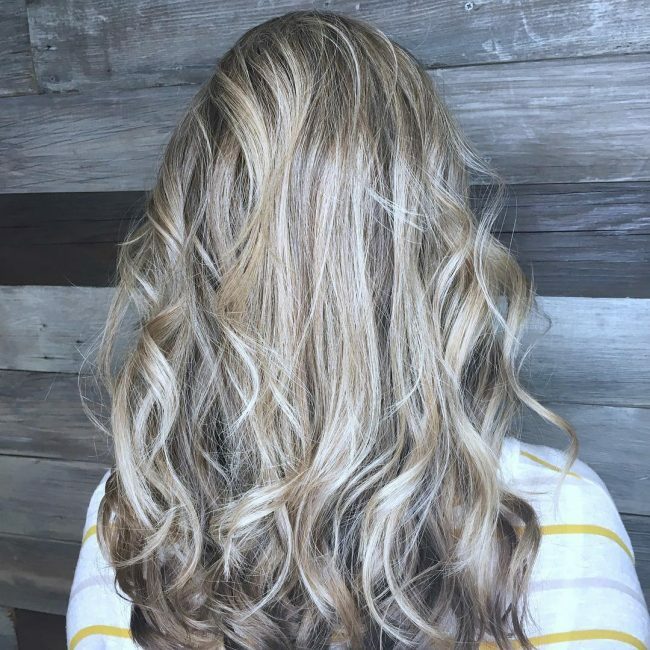 Do you like having fun with highlights? Layered hair deserves people like you because it works best with colors. But if you have to color it, it would be a brilliant idea to go for bright colors. The next thing you might want is running your fingers through your hair to create a messy appeal. Here is the exact hairstyle that would garner all attention without the need to say a word. First and foremost, do you see how the hair is smooth at the top and the waves coming in along the chin? You would need the exact trick. It creates a playful hairstyle with the layers resting on your shoulders. This style will make you look young and professional. Did anyone think that we can't create a formal appeal with a layered hair? They were terribly wrong. That is because this hairdo is fresh and hot to incredibly increase your productivity in the office. It also gives you a happy face that will energize you and your colleagues. Get ready for some compliments as far as you'll create this look. You are going to need long layers at the back, and you'll also need to brush some strands forward to flatter the face. Have we talked about colors? 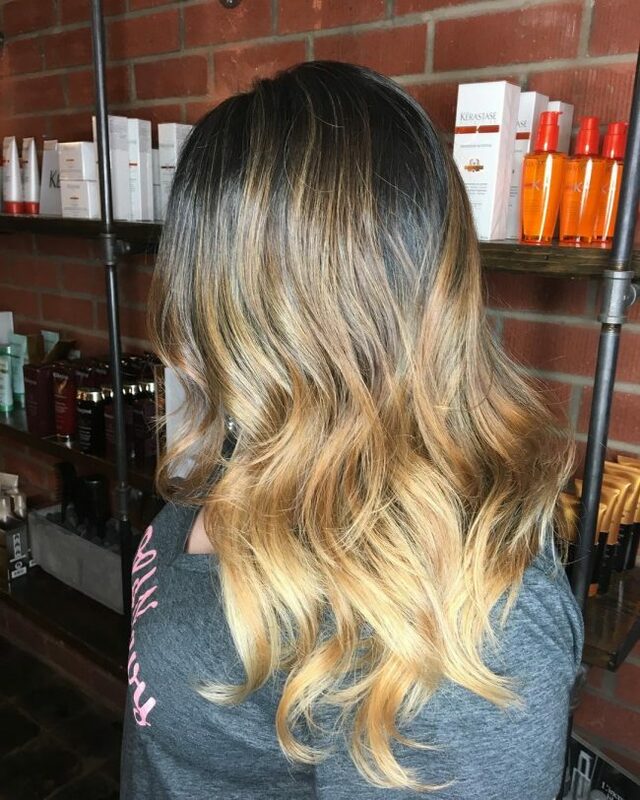 Go for balayage colors because this time they're sweeping all the nations. You've got a lesson to learn here. That is; never underestimate the power of long layered hairstyles. These styles start the job and finish it without making a defect. Take a look at this one. Get to the details of the side-swept, the curls, and the long length flowing past the shoulders. Now you understand that layered hair can keep your face smiling. There is one thing common with all layered hair. All of these hairdos start with a clean and dry hair. Otherwise, you end up having tangles even though you needed a neat style. Keeping that aside, here we have a chic bob featuring some layers. You definitely need this hairstyle because it's simple to create, and it's the right one, especially when going for a night party. 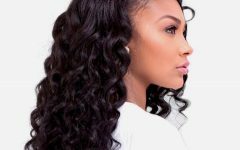 Sweep your long rocks to the side to not only show off your beautiful hair but also to let your hair communicate a chic woman. 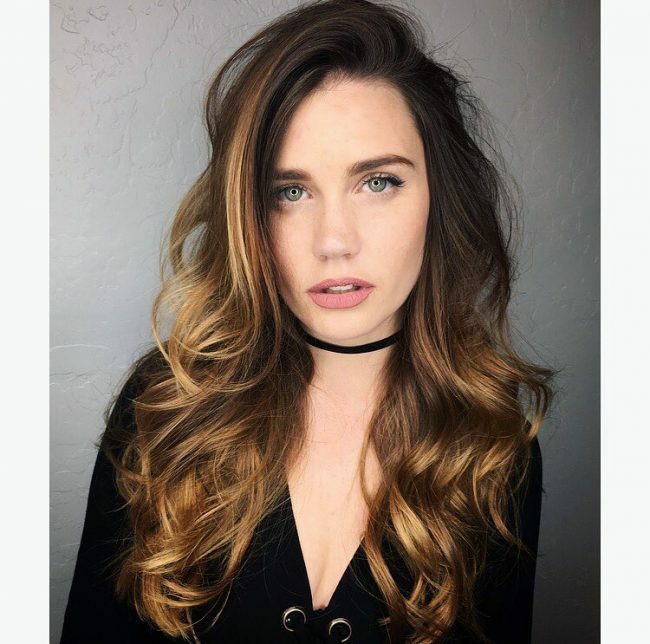 This hairstyle would need voluminous hair, but it would be nice if you let the waves give off both the layers and the volume. You can also include a touch of colors to make the exact bold statement. 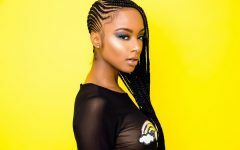 Despite that this hairstyle is easier to create and maintain, it's unimaginable that it can give you such a beautiful appeal. You better create it for your upcoming party and those memories will remain for ages. And it's not complicated, a slight side part on a smooth, layered hair is all that you need. Be sure that it'll make you the most stylish woman. 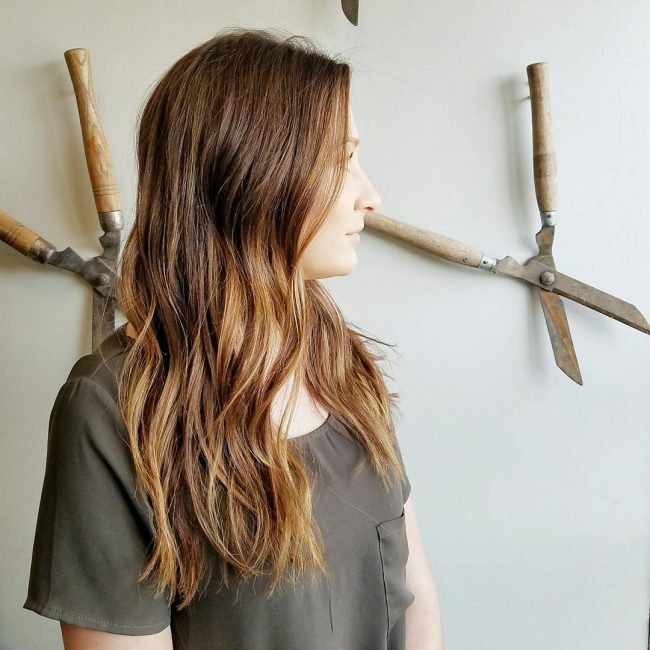 Do you want to show off your natural long locks? Brushing it alone will not finish the job. 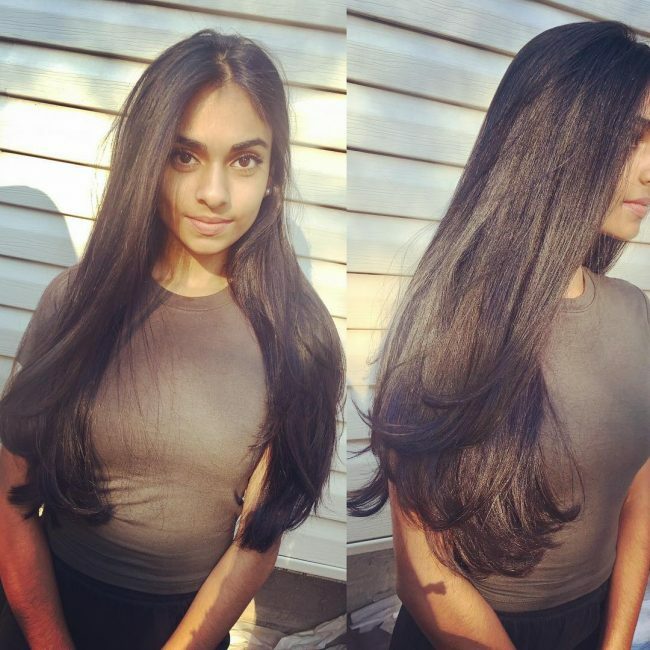 So create a long haircut featuring some layers to let the texture of your long hair come out naturally. This hairstyle can be the right picture that you should replicate. The layers or waves don't have to start showing right from the top. They can start from the midshaft, and then they can show off more towards the edges. Colors can help you grab some attention too. When it comes to hair styling, there are a million ways in which you can rock your lengthy mane. One of them is going for a simple yet fashionable wavy hairstyle. We are talking about this hairstyle that has all it takes to transform any woman’s look. 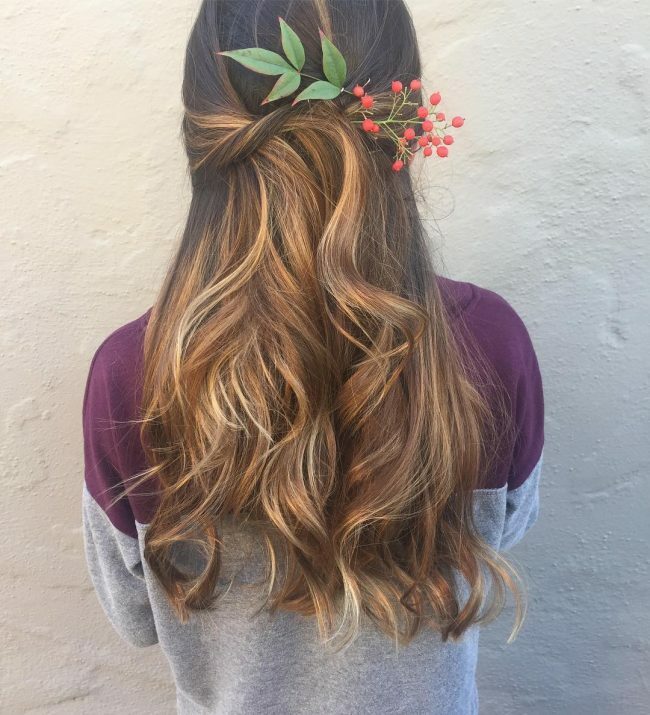 Most importantly, this hairstyle features subtle layers with balayage highlights. That alone gives it the exact touch that makes it a killing 'do. How about combining your long tresses with front bangs? If you like the idea, here is the style to replicate. However, you will need two tones to make it stand out like the one shown here. Color the entire top with black color, and don't forget to color the bangs too. 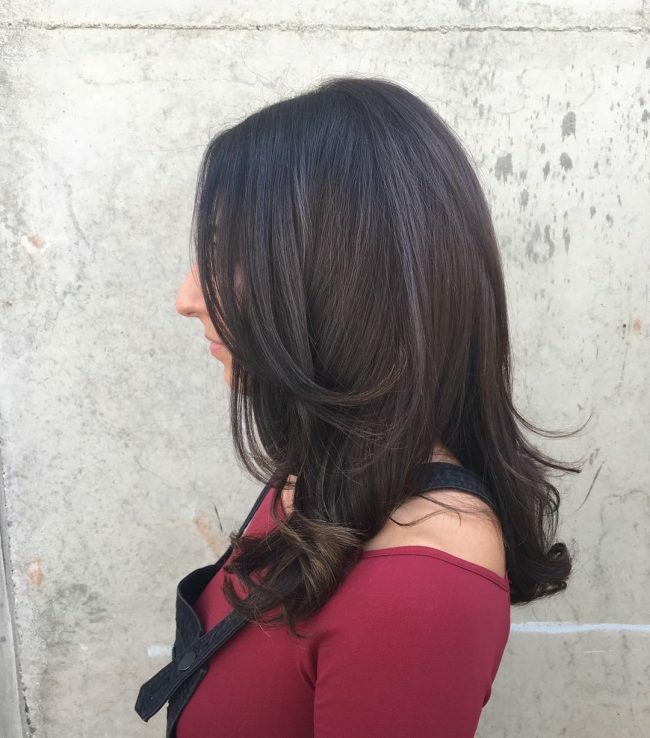 For the rest of the hair, create a beautiful transition from black to light brown ends. You'd need also brush the hair down to make the layers lie softly to each other. 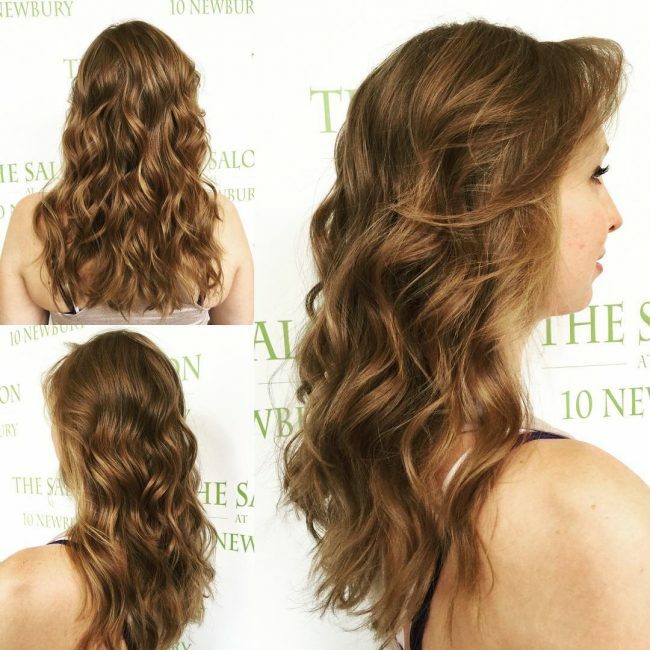 Curls and waves can help you transform your looks without doing anything else. More than that, it's a technique that doesn't require too much of an effort, and neither does it require lots of maintenance. The only thing that you might need is an extra push with colors. 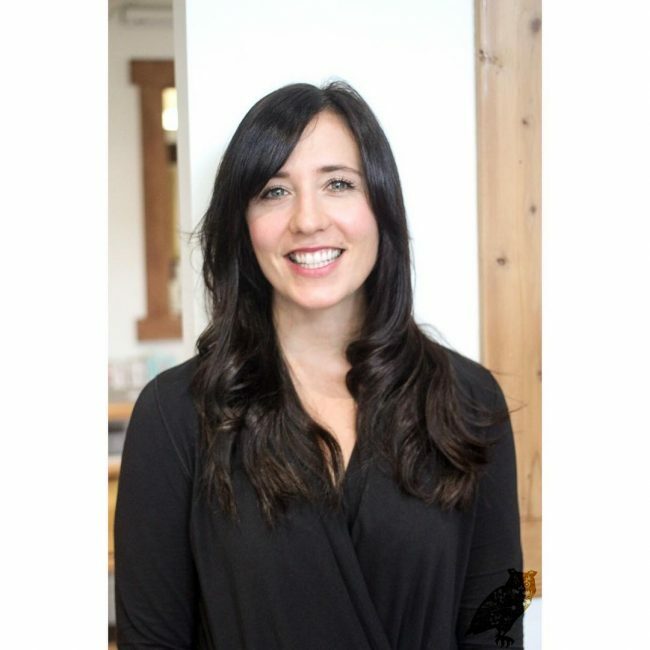 They are essential in making long layered hairstyles noticeable. Most women come to this 'do when they want to create an elegant style worth making any eye pop. In most cases, creating a sleek hairstyle makes the hair look neat and often creates a beautiful formal look. Do you know you can take another step and accentuate it? 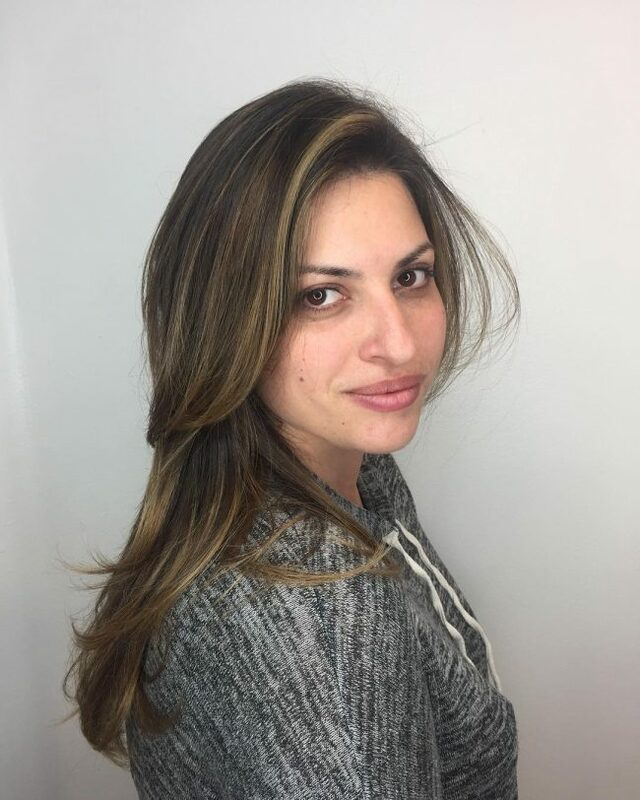 Just try the power of bright blonde highlights? It will help you to show off your neat strands. Also, feel free to take this picture with you and use it while explaining to your stylist. Take this hairstyle to express your love to anyone who sees you. Are you wondering how? It's because this hairstyle doesn't just bring the beauty to your hair, it even accentuates your beautiful face to sweeten it with a smile. 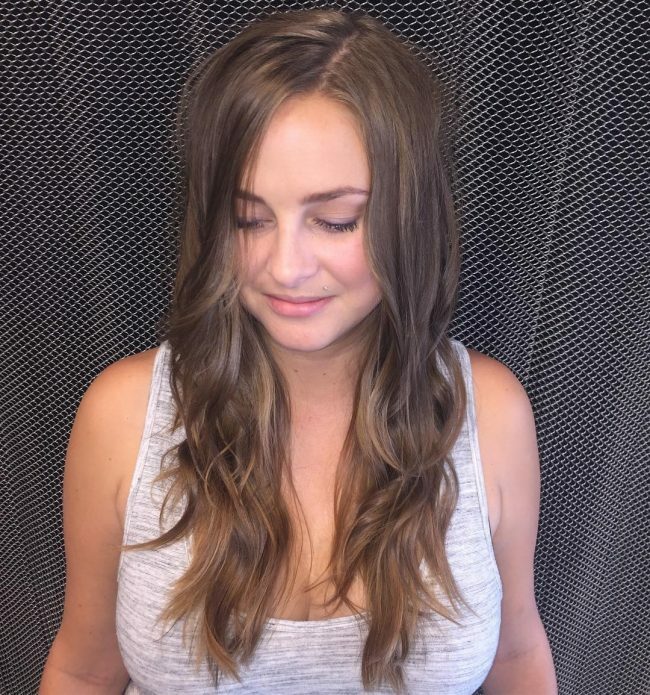 Create your layers with your long locks and brush them down. 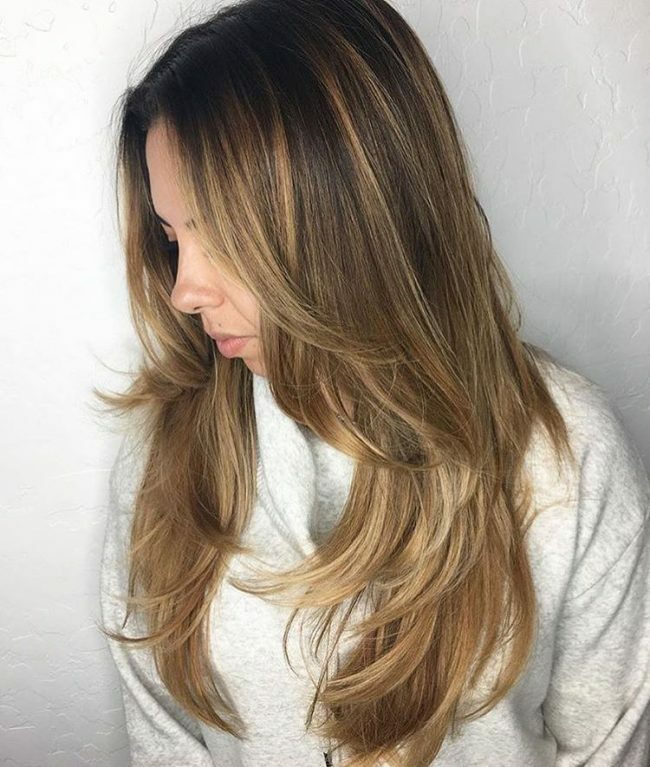 Don't be afraid to bring the effects of balayage highlights. Finish the job with a slight side part. The heavier it is, the better your hair will look. That's what trendy women are saying when taking this hairstyle. However, it doesn't necessarily mean that this hair is heavy, it is the fullness that makes it appear like that. Even it's a fresh take that most women are taking when they want a face-framing look. Remember that you'll need layers to get the exact volume. For a climatic style that will keep giving you all attention wherever you go, sport some messy layers. You can try enhancing them with a side part that covers one side of your face. Follow the same path that this girl takes. 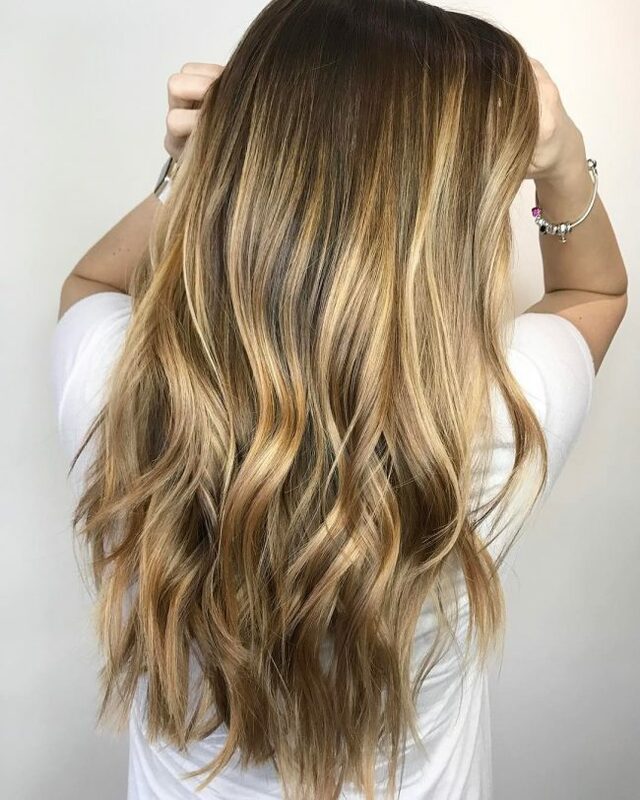 That is creating a smooth coloring with the glowing ends. The final look will make you a celebrity. Do you want to surprise even your hair stylist? Show up there talking about a hairstyle that combines both short and long layers. 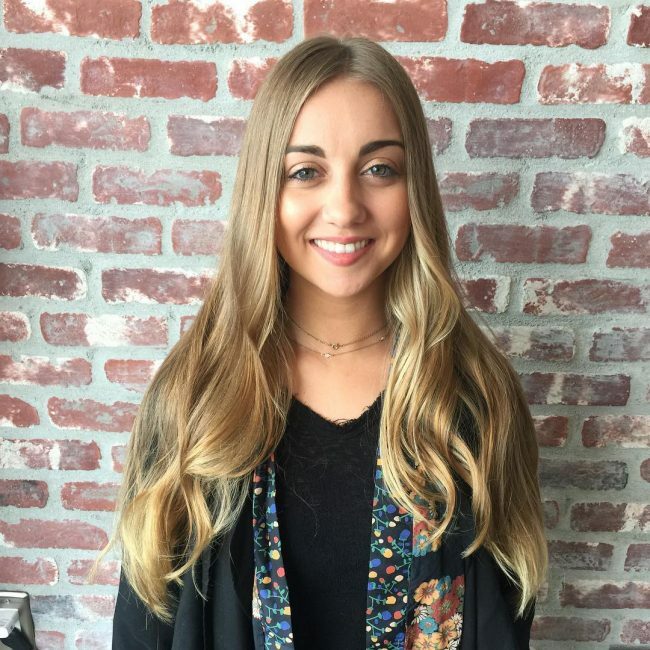 Rarely do most women think about this hairstyle and that makes it unique. So with this hairstyle, everyone will be looking at you with their mouth open. It's a style that comes with extreme layers of varying length worth giving you a new world to rule. Styling long hair doesn't have to be stressful. It only needs a little effort, and everything turns out dramatically. Take for example this hairstyle. Just a side part and curling the ends. The rest we can also include is the layering that gives the hair its shape and movement. You can take this hairstyle always to conceal you simple styling techniques. There you go! You needed a hairstyle that will elevate your looks for all of your special occasions, and now you have it. You can create it in whichever method you want, but make sure you include the most important ingredients. These are the layers, and the curls which are making the hair curve along the edges. Apart from that, you can include some colors for a touch of elegance. Take some time to swallow this beauty. It's all the result of strategically layering your chopped layers, plus adding the flavor of colors. Just that. Take this hairstyle to inject life to any lifeless hair. 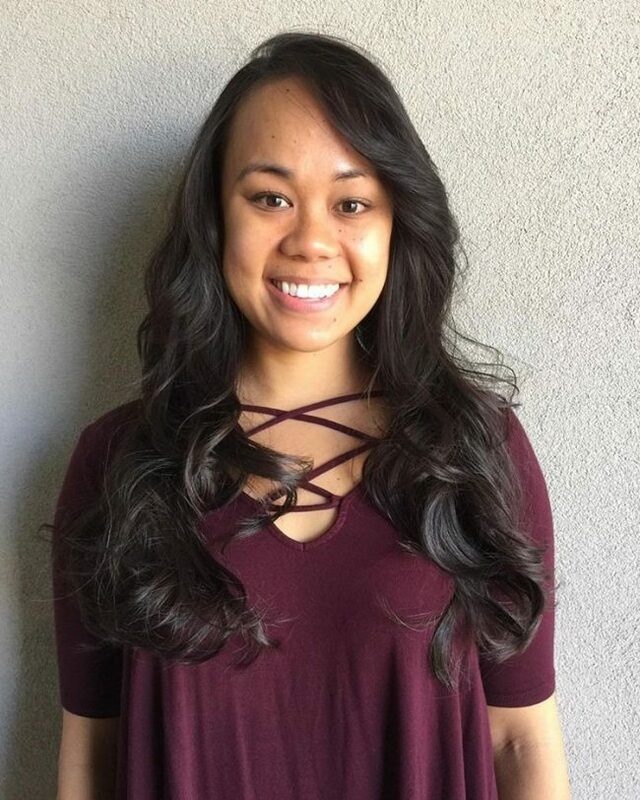 The only thing that's important to master is how to play with a razor or scissors, coloring, and curling your hair so that to boost its volume. Some people call this magic, but those women who have mastered the game refer to it as 'making yourself presentable.' 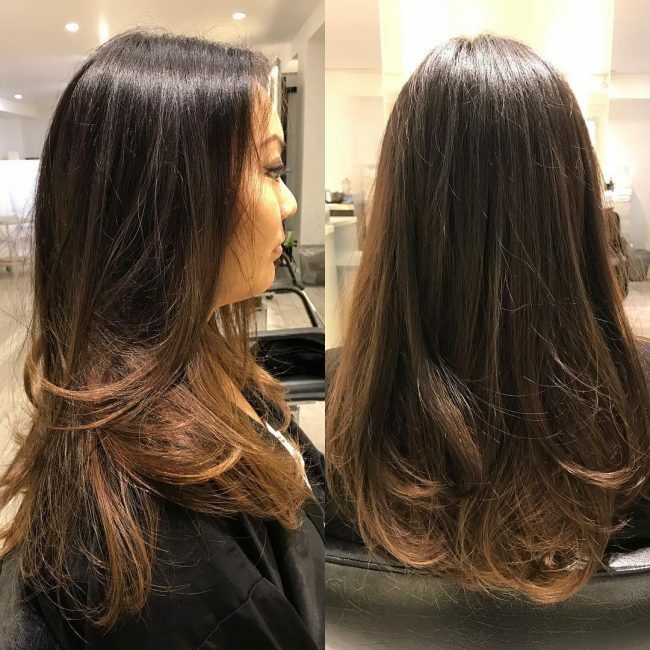 It doesn't matter what you'll call it, all that you need is to know that it's one of the exceptional long layered hairstyles. 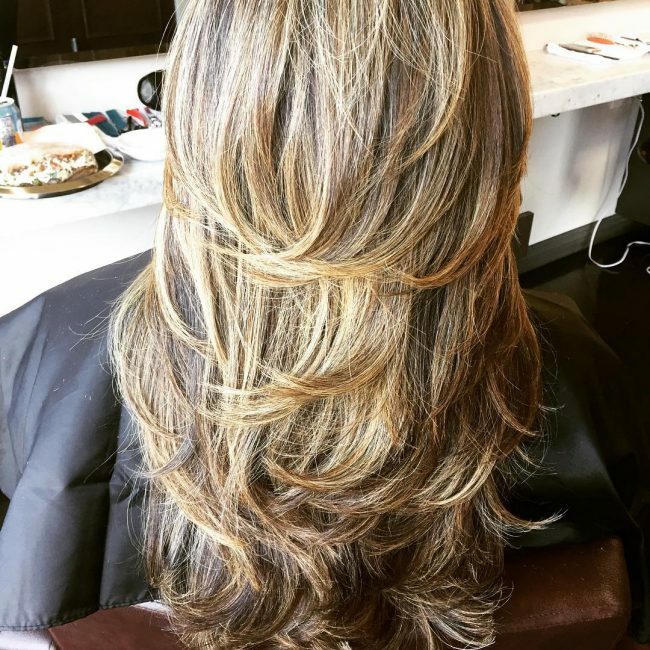 You can feature it simply by going for a professional color melt. You'll also need to pull out those layers that look fresh and neat with their glowing ends. Consider this hairstyle as the best one to take while going for a vacation or when hanging out with your friends. The classic golden hue will create a welcoming gesture that will make you a topic of the city. While making it, go for the same side-swept to flatter your face. You can always enhance your appearance with some goggles. 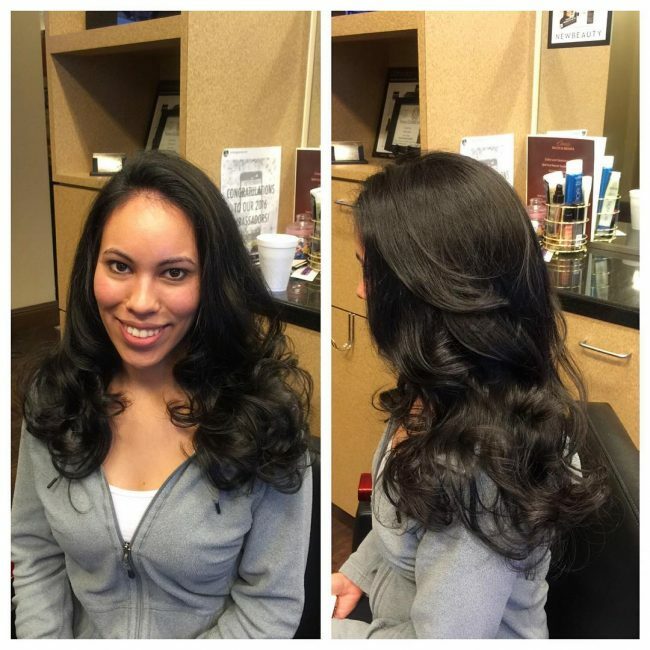 No matter the length of the locks, any hair with layers become the first-class hairstyle. If that's any length, what about being specific and talk about long hair? For sure that makes you the styling queen. Furthermore, long hair is effortless when it comes to styling. Just a cut, and some waves to create the layers. That's it. The way the stylist created this hairstyle with the ends lying softly past the shoulders, and the layers creating the body and movement, makes this hairstyle nothing but a masterpiece styling. 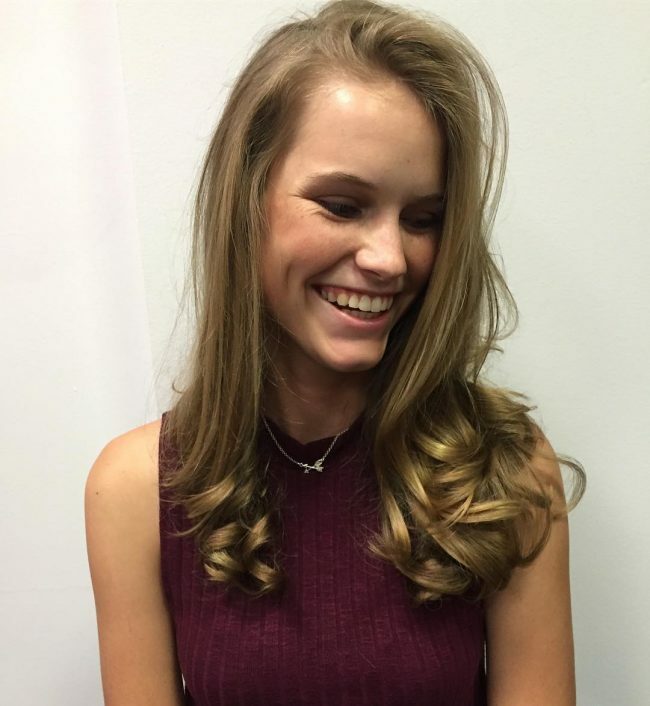 How about telling you that this hairstyle is effortless and requires minimal maintenance? That inspires most stylish women to make an urgent call to their stylists. Maybe it can inspire you the same way. Talking about layered hairstyles, this is truly packed with all the drama in case you decide to show off your long locks. And not only that, even when you choose to show off your bluish shining locks, it will still stand by you. Be sure to leave the crowd impressed. Rich and playful are the words that will come to the mind of your friends when you show up with this gorgeous look. 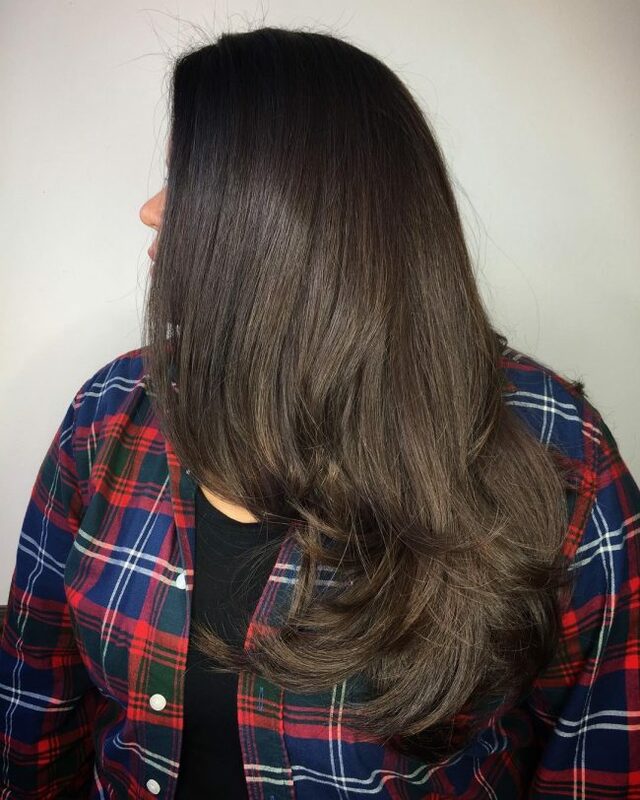 This hair is simply the true meaning of embracing layers to your hair styling. You can take this look for either for your formal or casual occasions, and nothing will look odd. 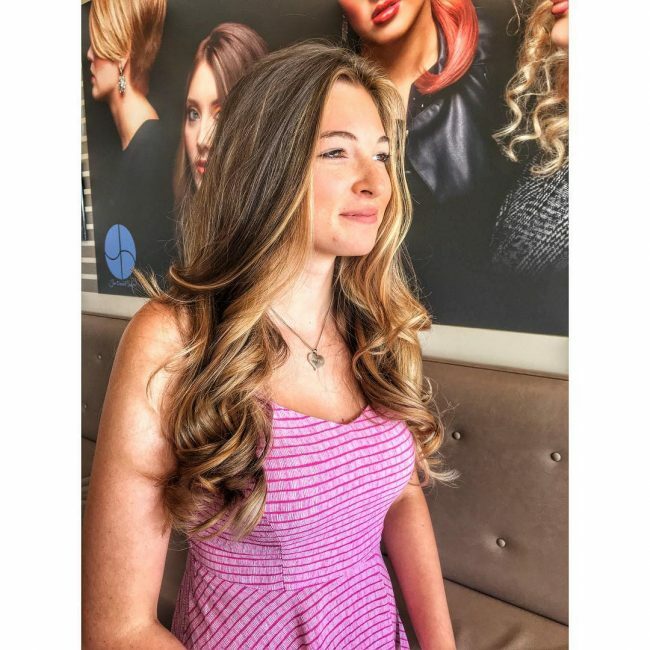 When we come to hairstyling, all that matters is creating a fresh look that will make you pretty and comfortable. 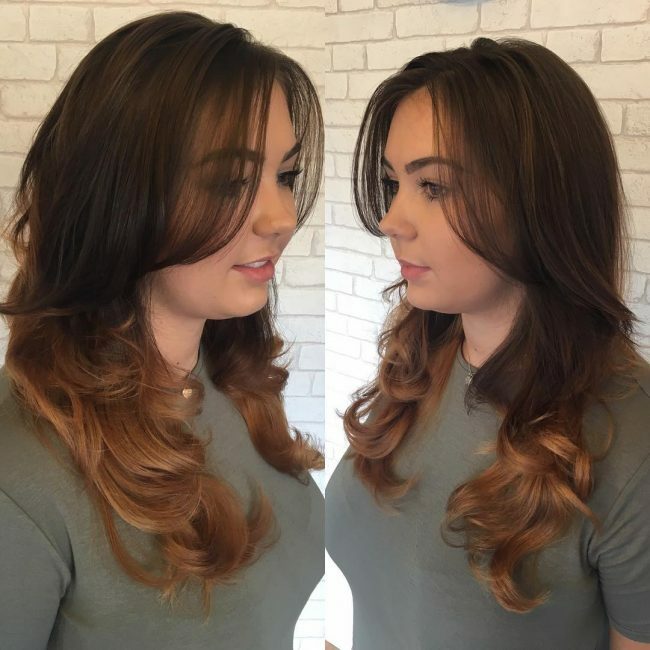 This beautiful layered long hair shows how you can rock your layers by holding them at the back of your head. More than that, the embellishment keeps the hair fresh all day. This one is the exact look for an edgy girl who doesn't mind getting disrupted by numerous compliments coming from any direction. With a fresh haircut featuring brushed down layers, you'll be making every head turn. And every time you walk out of your house, you better be sure that you'll be dressed to break down every wall that would be standing in your way. 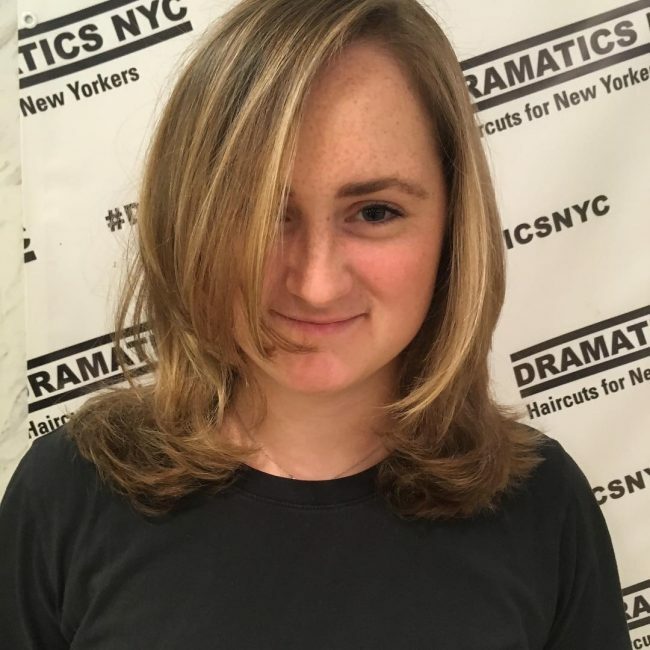 Ready to cool down a layered haircut featuring blonde with natural lowlights? By the way, even hinting towards curly ends is hot enough to leave anyone holding their breath in admiration and awe. 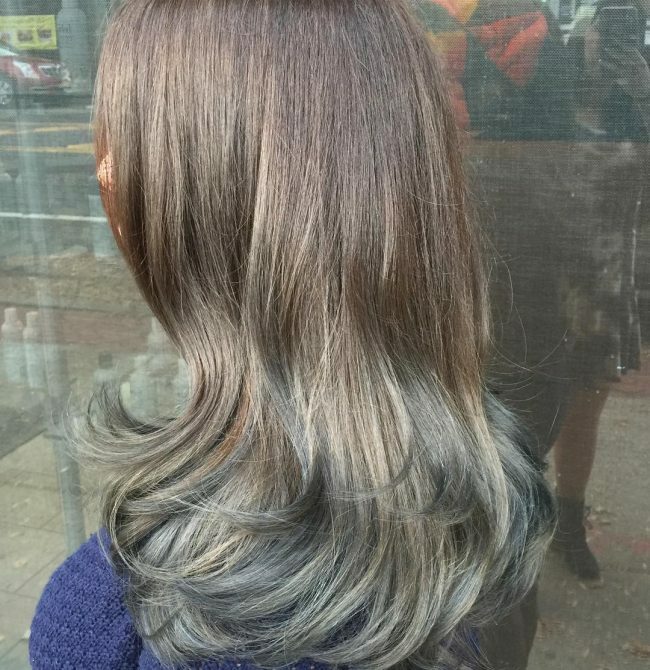 Furthermore, the stylist in this hair did a professional coloring job that makes everything look elegant. Feel free always to take this look when you want to show off your long mane. Do you want to shine with the glow of a trendy touch of long layered hairstyles? Well, leave the job to this reddish hair because it's truly unique and qualified to finish the job. One thing we learn from this hairdo is that red is an exquisite color that's very intriguing. And when used to color your long layered hair, anyone who takes a glance would be glued to stay looking until you go out of sight. 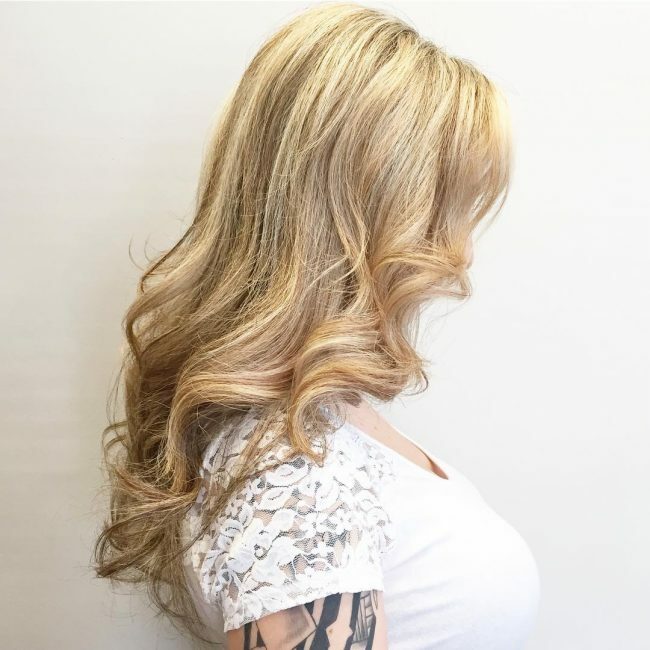 This long layered hair with a chic color is truly a hair flavoring job. 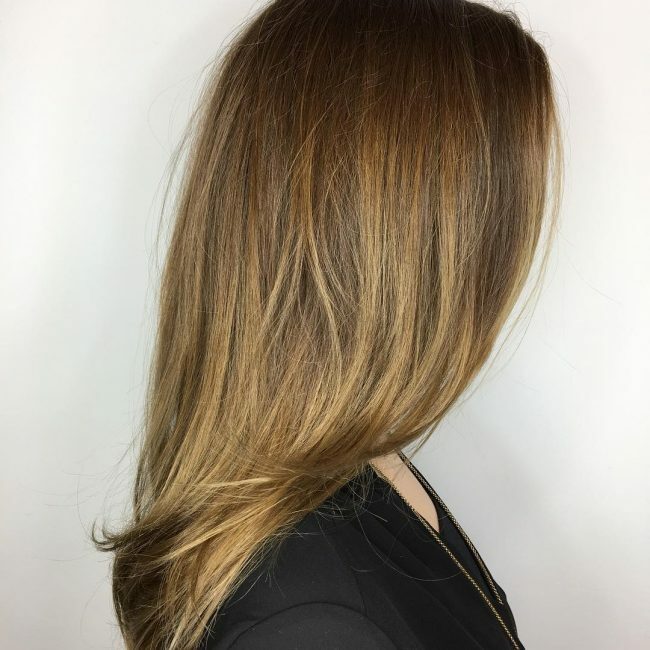 The gentle balayage highlights create a superb color melt from the darkened roots to the lightened edges. 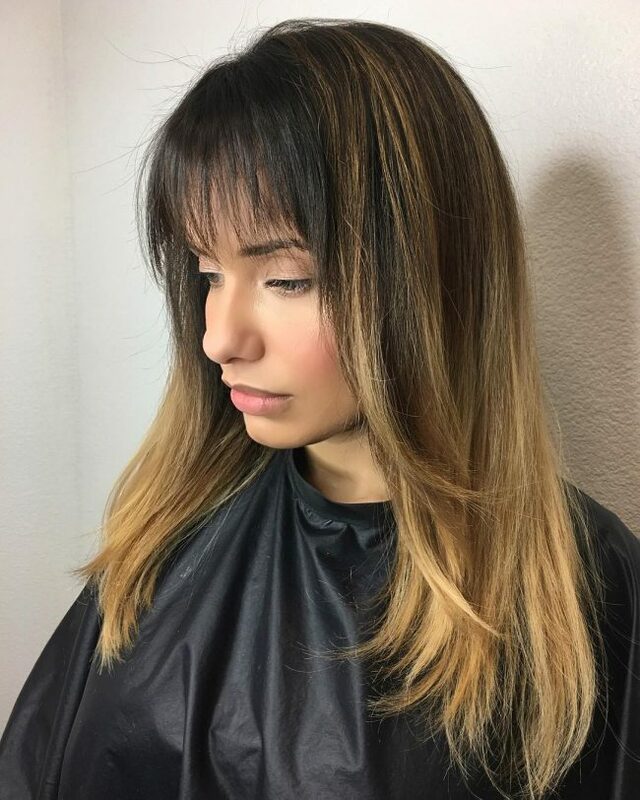 The blend of the two colors plus the cut takes this hairstyle to its highest level. Also, we can't forget the flavor from the soft, light locks flowing towards the back to satisfy all the need for boldness. 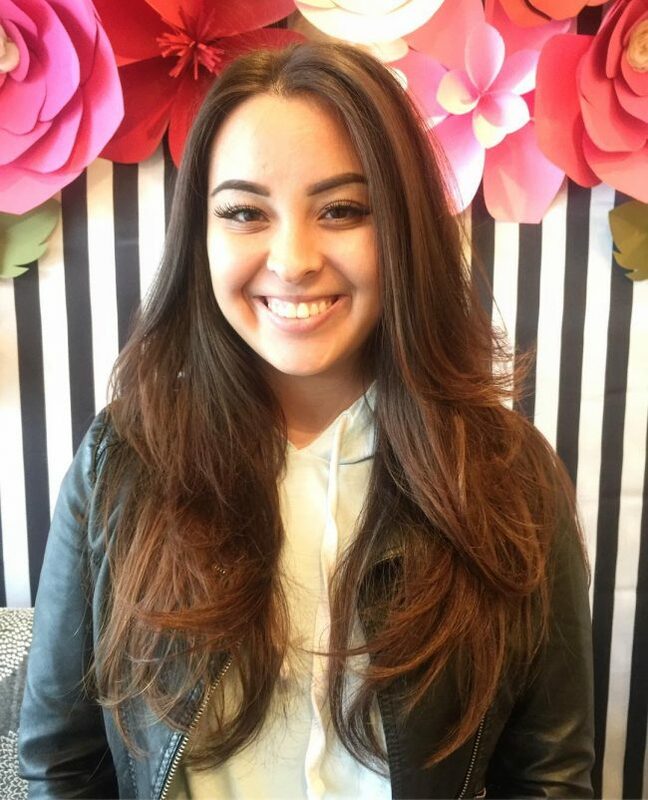 Are you in need of a hairstyle that will make you feel girly and modern all at the same time? 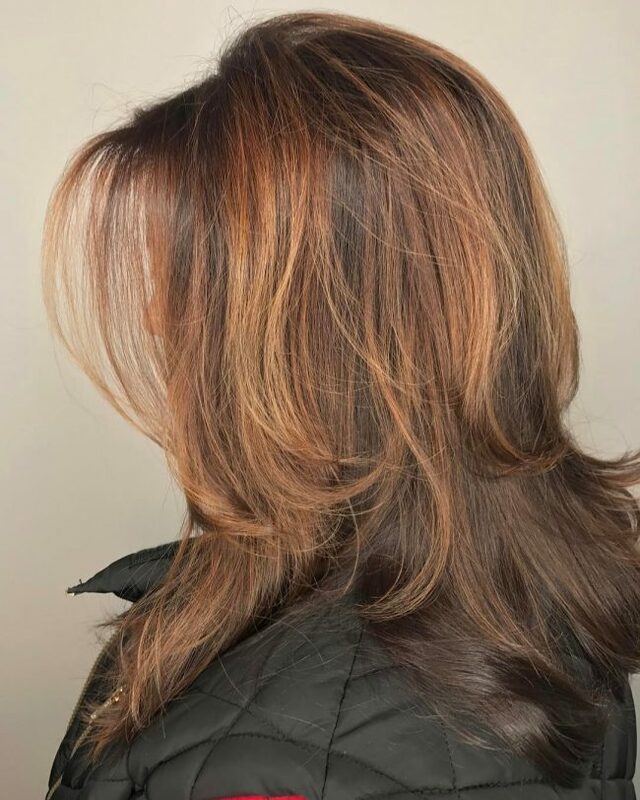 This highlighted hair is all one length, but it includes some chic layers that offer to it a soft feel. What really pulls the layers together is brushing the hair down to create the elegant volume at the back. Be sure that you won't go wrong by taking this hairstyle as your casual or formal outfits. 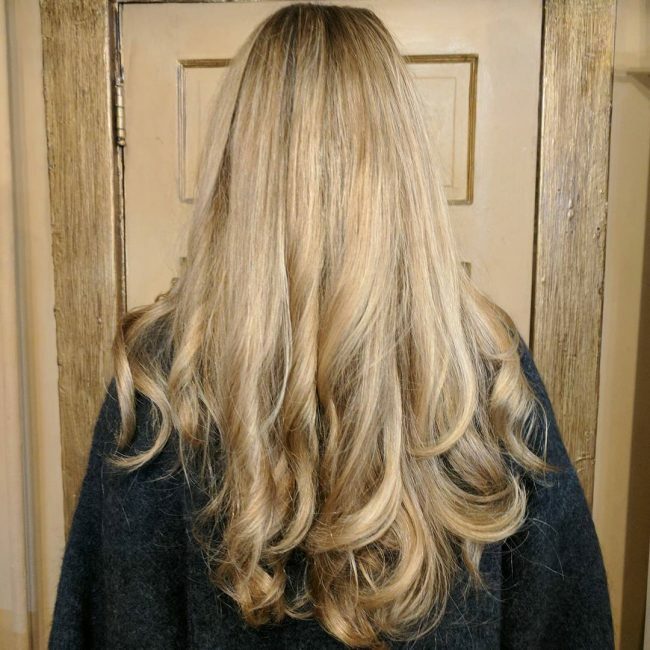 These long locks are as easy and carefree as what trendy women are looking for. If you want to feel what this girl is feeling, it's just a matter of a time. That's because the hairstyle doesn't take long to create. First of all, remember to shake your head or run your fingers through your hair for a messy look. 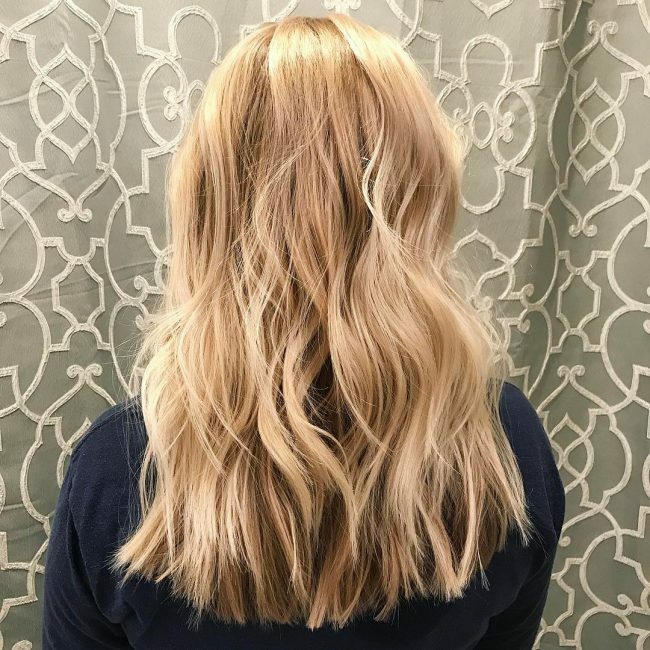 The rest is the blonde midshafts and ends you'll create with the exact colors to make the style look cute. 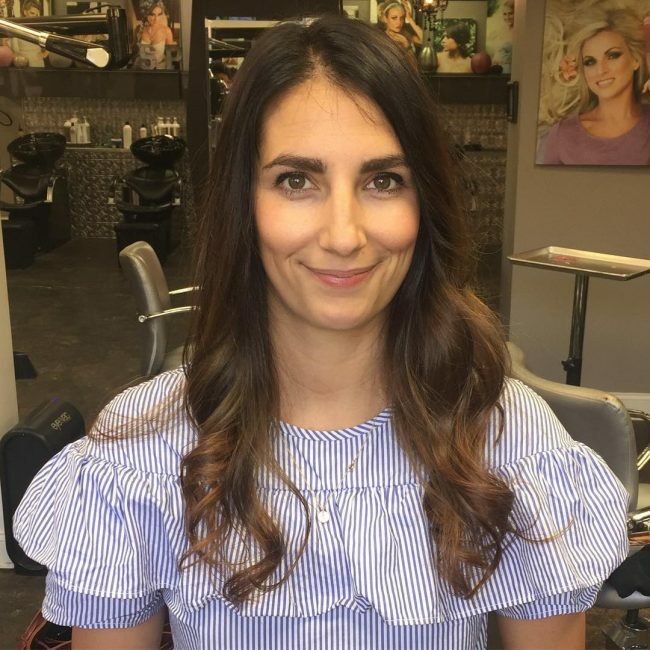 This style is especially applying to all those hunting for a 'do that is gentle, classic, and promises to never go out of style. For sure it is. Messy layers have been around for ages, and they don't even seem to give up their highest level of elegance anytime soon. Even looking at this hair, the light shades communicate a killing hairdo. So if you're a girl looking for a high-class hairstyle, this won't leave you high and dry. 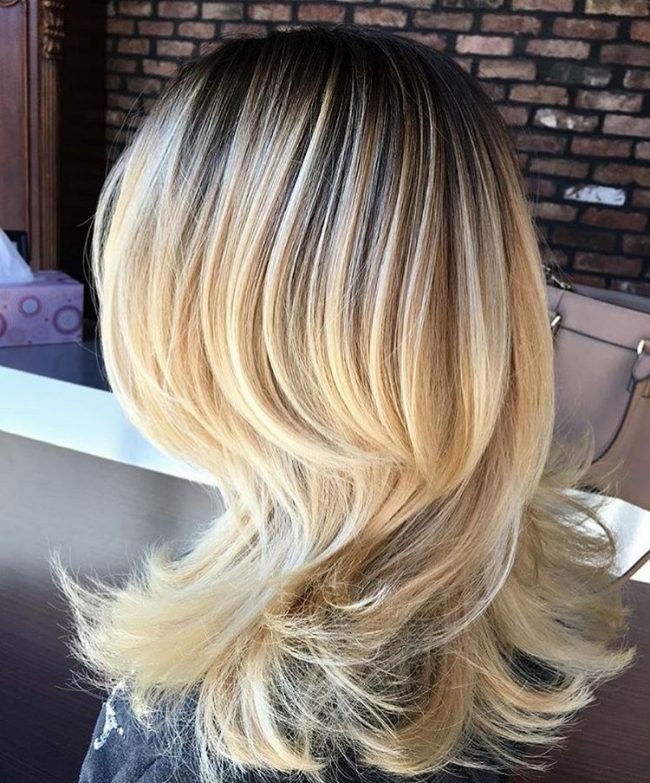 Going with a light shade of blonde is an excellent idea. Even you're going to receive numerous invites to the parties and occasions. And more surprisingly, your friends will be ready to cover all your bills. Are you wondering why? 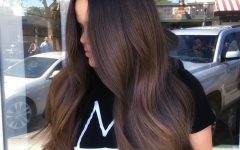 It's because no girl has ever gone wrong with this brilliant shade all over her layered hair. It all turns out flawlessly. You'll believe it's not a joke when you get the first invite. If not for these long layers enhanced with this darker tone, maybe we would have ended up with standard boring hairstyle. But since we didn't follow that path, we already have a hairstyle that also embraces a slight touch of scissor to create a gorgeous dimensional style. Sincerely speaking, long layered hairstyles are good for pulling out an exceptional appearance. But when your want something that creates a bold impression with your hair, a style featuring loose waves all over the head can do better. 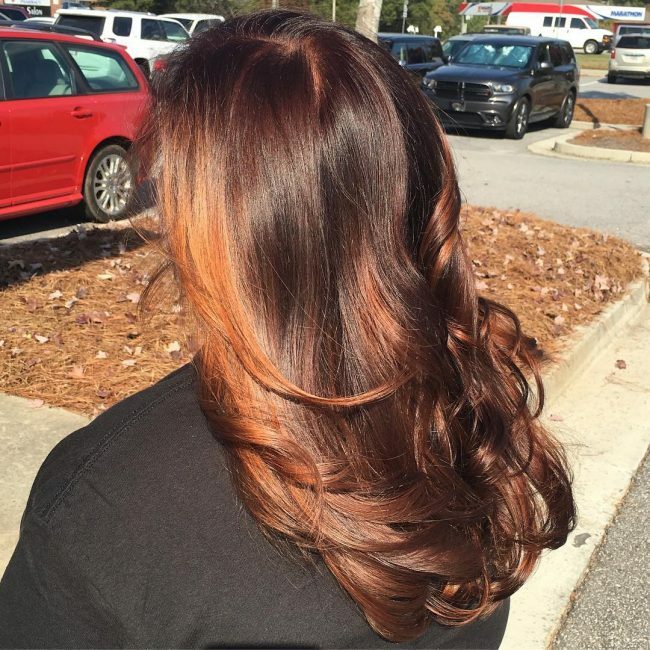 Besides, copper tone and other reddish shade can easily help you in getting the same effect. 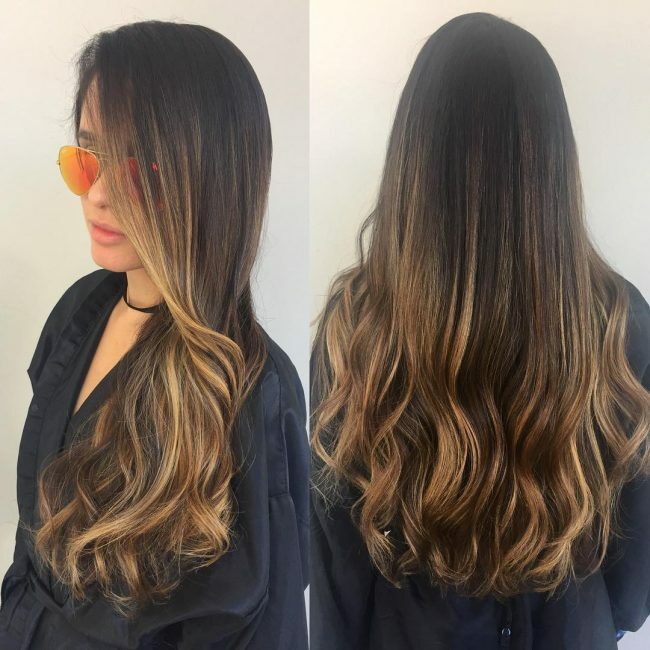 This hair styling idea can help you achieve a smooth transition to a balayage look that comes with a dimension too. It also means that you will have to reveal your roots with a dark blonde tone. 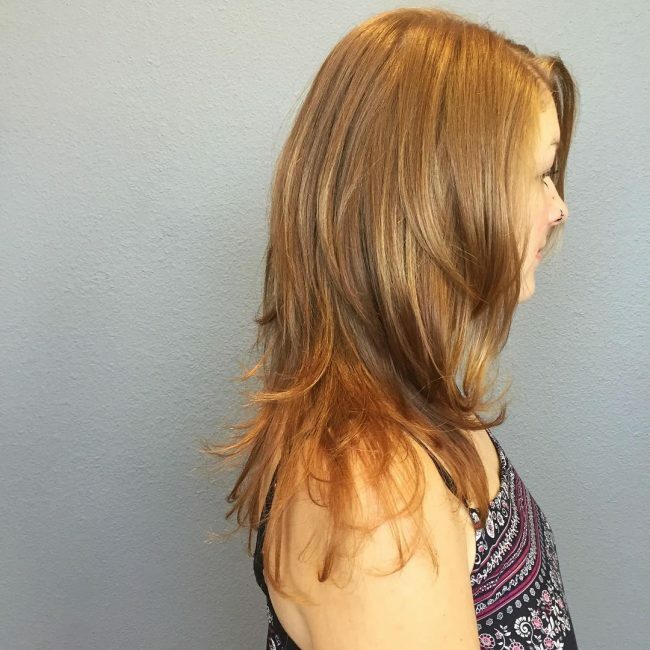 Then to make it come out correctly, you bring in a warm balayage tone to color the entire head. The rest is just creating messy layers to communicate a pretty girl moment. A side swept trick looks cute and flirty, and when used to style a long layered hairdo, it adds all glamor to the hair. Besides, any long hair with a side swept makes someone look happy and lovely. Just check at this girl. So if you'd want a hairstyle that flatters your face elegantly, this hair shot will always be here waiting for you. A subtle side sweep often whispers elegance and delicacy. 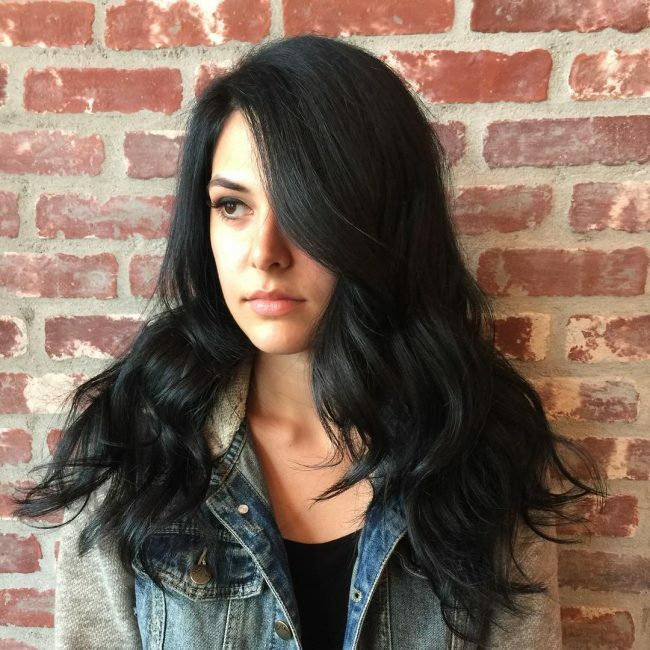 This black hair is a real eye-catching solution that you can take to any casual occasion you have. It makes the layers appear classy and totally perfected every time you go out to show off your hair styling game. Sometimes when you want a simple look yet a stylish one, you may opt to go for a hairstyle that conceals your long layered cut. However, this style takes into consideration that there are some days you might want to let things go off. And with that, it comes with a face framing effect that you can easily create with your layers. It's a style furnished with all beauties. Yes, long layered hairstyles are a popular option for all ladies who swing with the trend. Use this hairstyle to keep those locks long and flowing as long as you can. The gorgeously cascading layers will catch each eye and glue it to the rest of your body features. The only thing that you'd be required to do is to thank your stylist for giving you such a killing look. Now you're a witness that long hair can never look heavy and weighed down. Even it will never show such impression as far as you'll create layers everywhere in your mane. 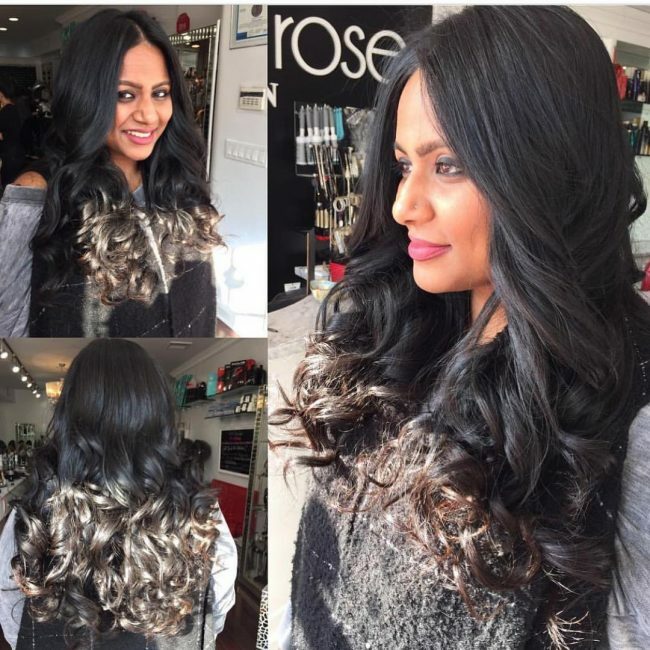 The layers in this hairdo make the long tresses feel amazingly light and bouncy. You can also get regular trims to keep those ends cropped and neat. 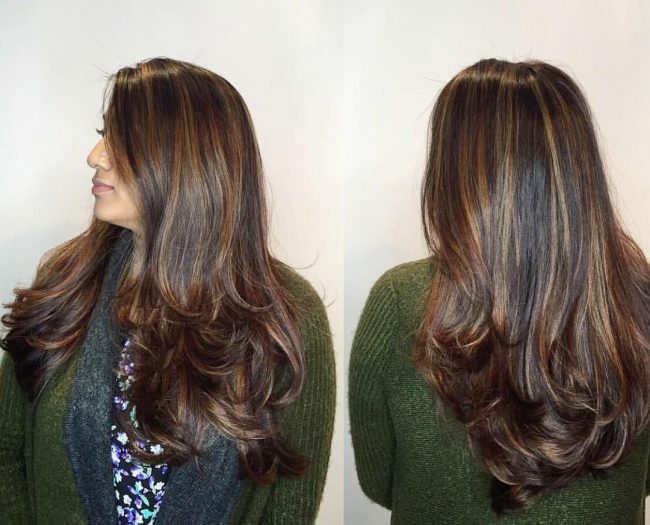 Long hair looks more playful and fun with layers. 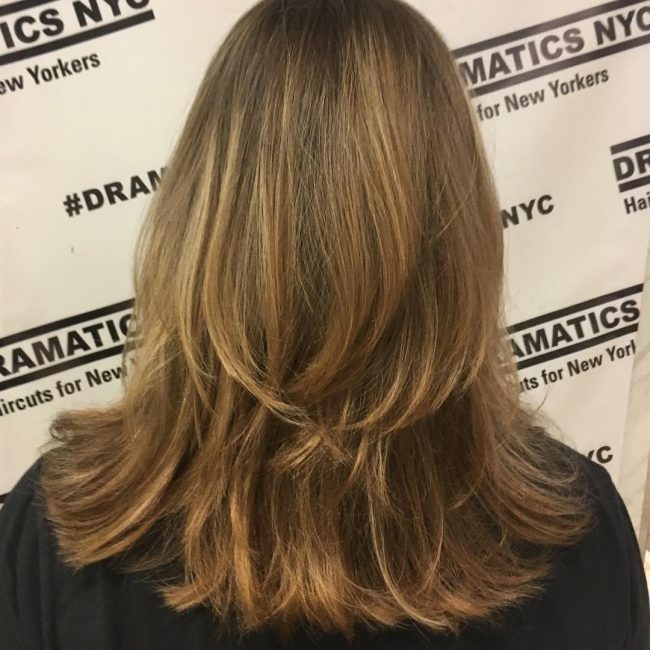 Besides, they seem to embrace any balayage shade that you throw at it. By the way, never let your layered hair starve when it needs the nourishment of colors. So it’s always important to go for either one or two colors. But in most cases, two shades with one taking the roots and the other one cleaning the edges creates a fresh look. This textured, colored hair is what covers most of the modern hair fantasies. If you badly want this hairstyle but aren’t sure how to cook it up, all the secrets lie within layers, highlights, and lowlights. 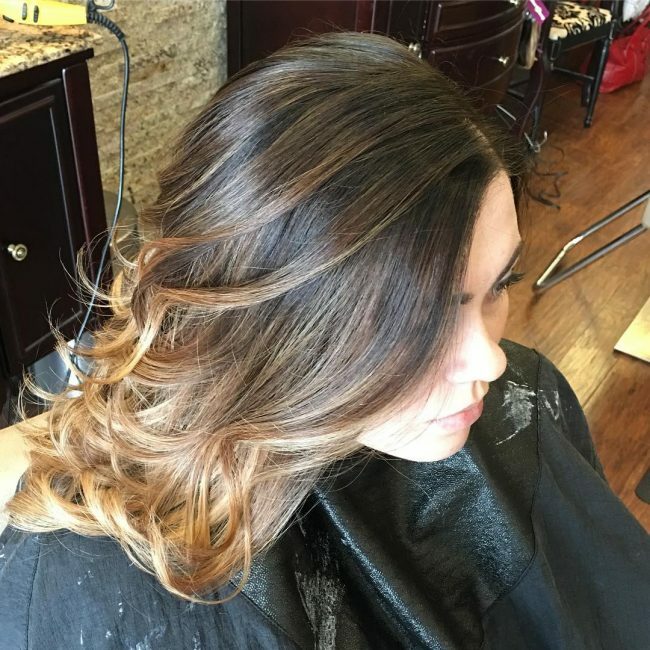 Color your hair and then create these layers flowing down your back. Then you've to run your fingers through the smooth locks for a chic messy vibe. Most women think that long hair is hard to style. They also believe that when they let their hair grow, they would be forced to create and extra time for their hair caring. This style proves to you that all that are lies. If you want, you can use this hairstyle to bring in the impression of a classic casual look. Create messy, and imperfect waves that will lead to messy layers, and you'll never need an extra time for that. This girl truly feels all the love inside her. Do you want to know something that makes fashionable women stick to long layered hairstyles all year round? One reason is that when you combine its volume with the blonde tones, it comes with life and vibrancy that fills both the hair and the face. Apart from that, you only need to smile, and everything looks lovely and smart. Nothing can beat the elegance of this hairstyle. Do you know why? Of course, it's the combination of soft flowing layers with curled ends. That's one of the things that make it super cool and unique. 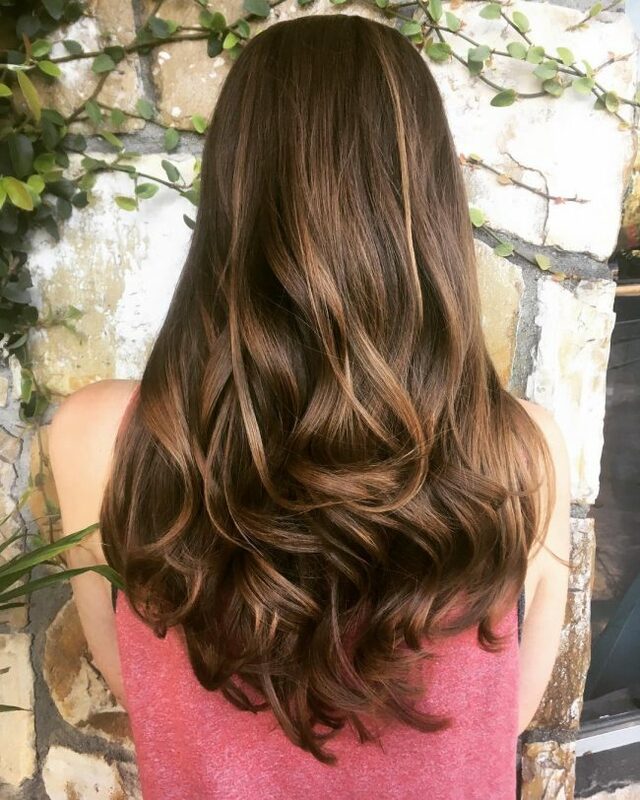 Other things are the color melt from the roots to the ends, in addition to a cut that helps this hair to reveal its beauty. So, let go for the layers. Here comes the ultimate pretty girl hairstyle. Super easy to create, as it only needs you to do a little play with your hair to knock off the bangs. 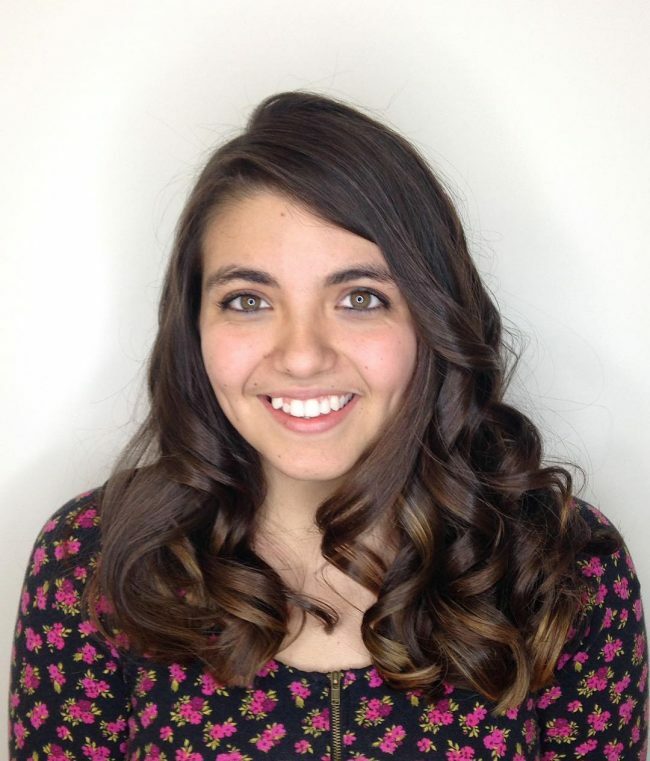 Without a waste of time, throw long side bangs featuring flattering, face-framing highlights. The next thing you're going to need is those curly locks. And by the way, when you're making curls, make sure you accompany them with layers. The last assignment would be showing off your blonde tones on your hair. What are you waiting? 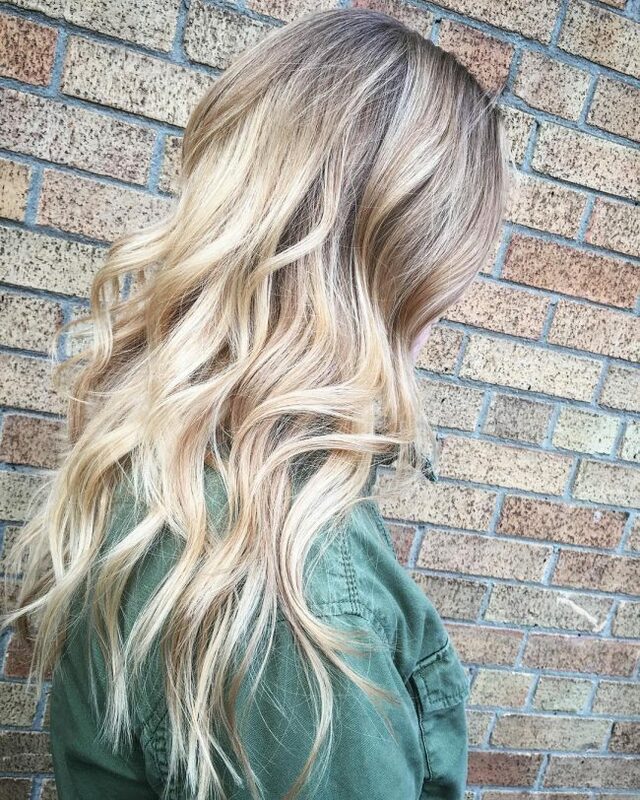 Take your long locks up a notch with natural highlights. And to surprise you, this has been a big secret that celebrities have been keeping from us. But now that we've got it out, we are ready to outsmart them in styling. So we are going to start with by featuring long layers and then finish with some bangs to help us climb higher in the elegance ladder. 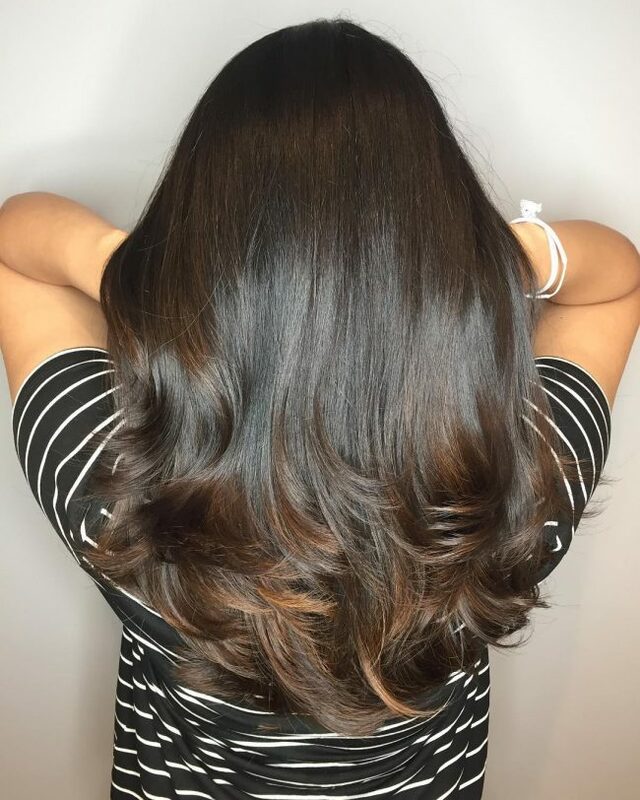 This hair is simply gorgeous, especially with the layers flowing smoothly, not forgetting the perfect job of taming all the flyaways. What’s comes more is the way the colors showcase dark roots with the lightened ends. This idea makes the entire hairstyle look fun and playful, more so when the curls rest on the shoulders. Have you looked at the volume? Definitely, it's amazing. A great smile for a great hairstyle never hurts, right? Here we've got a style that will always keep you smiling. Not for other reasons, but because you'll be the most stylish woman among your friends. Best of all, this hairdo doesn't need you to prepare crazy styling products or chemicals. Just get ready to create layered waves. Soon you're going to be a happy woman. Without a doubt, the length of this hairstyle is universally flattering. Apart from that, everyone will admire the way your style will look if you throw together your layers as seen in this hairstyle. That is, creating them in a way they look super convenient when wearing the hair down. 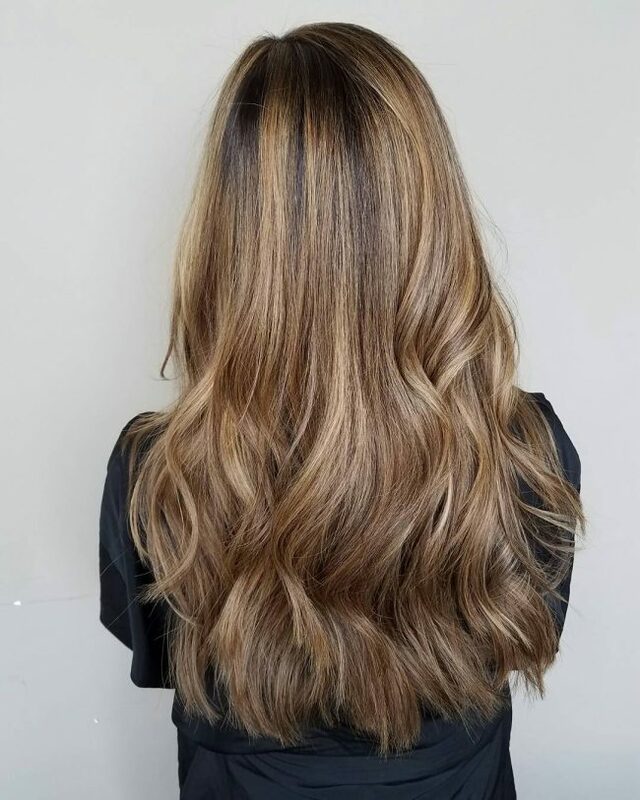 Something else, it won't be bad if you get the same balayage shades. That helps to keep it ultra-modern. You'll never go wrong with this hairdo. 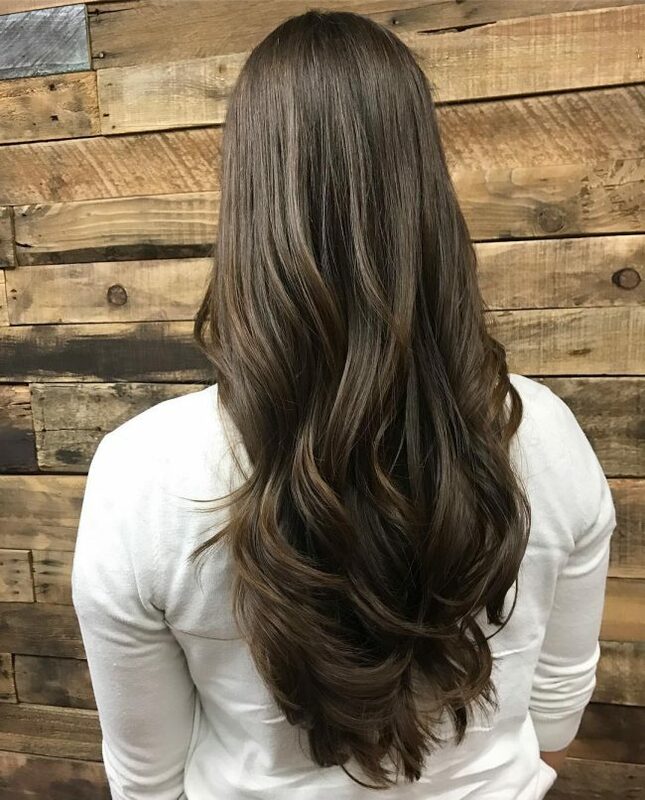 Rich, dimensional brunette locks flowing down your shoulders? Of course, yes. It's a style that comes with all feelings of elegance. The best part of it comes with its effortless nature, and the way it's easy to maintain. You definitely need to recreate it. 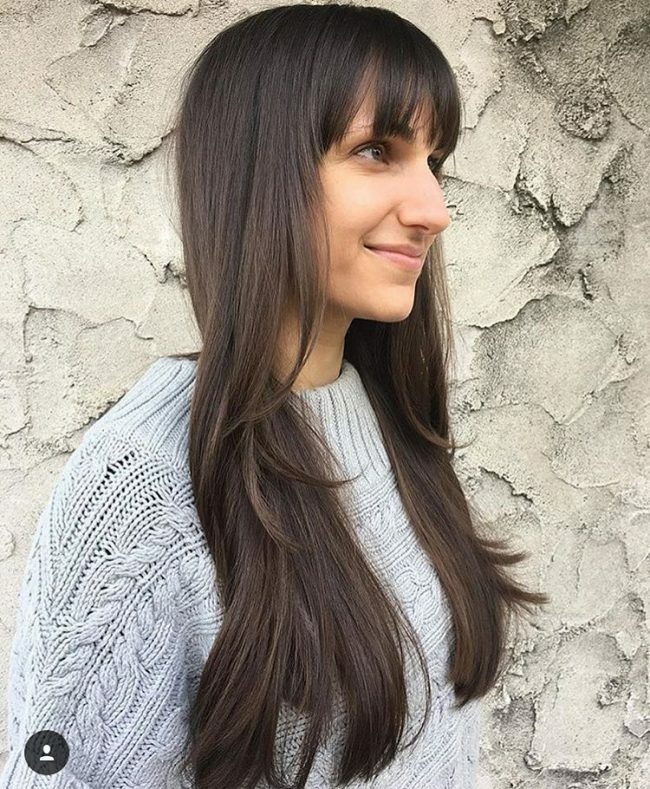 You got to adopt this chic vibe with smooth bangs and textured layers. That combination alone creates a fantastic effect that can make the entire hairstyle feel fresh. Just be sure to pair it with a black color to enliven the rest of your outfits. 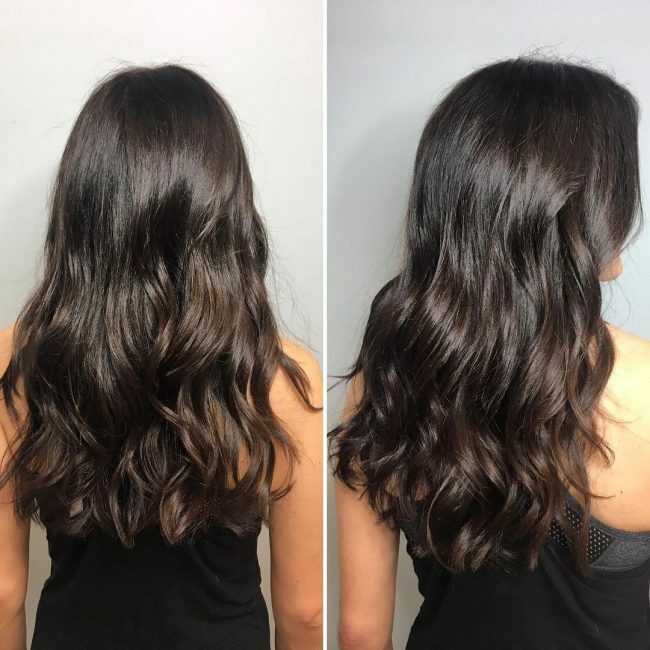 There is a difference between long locks and long layered locks. For ladies who are after a hairstyle that knocks all the others down, you should forget about just brushing your locks. Create some fun with dimensions that not only create bouncy layers but also keep your mane looking healthy. And, to spruce up such an elongated hairdo, go ahead bring in some colors. Can your hair manage to go past your shoulders, or go beyond your ribs? If you answered yes, then you've got a perfect opportunity to play with your hair and create a dramatic appeal. More so, you can also give your stylist a chance to highlight your hair with fantastic colors. Create this look that feels you with all feminity, and everyone will have a story to tell. Layers set up ground to give your hair and your style a natural, care-free moment. Apart from blonde highlights being a great addition to long layered hairstyles, they also add fun and bold elements. For example, the vibrant colors in this hairstyle look fantastic with flowing layers. In fact, they create the overall futuristic appeal. This one is the exact bounce and body that can help you show off the sassy girl in you. Let's think about it. Would it have been possible to pull together this look without layers? Not at all. 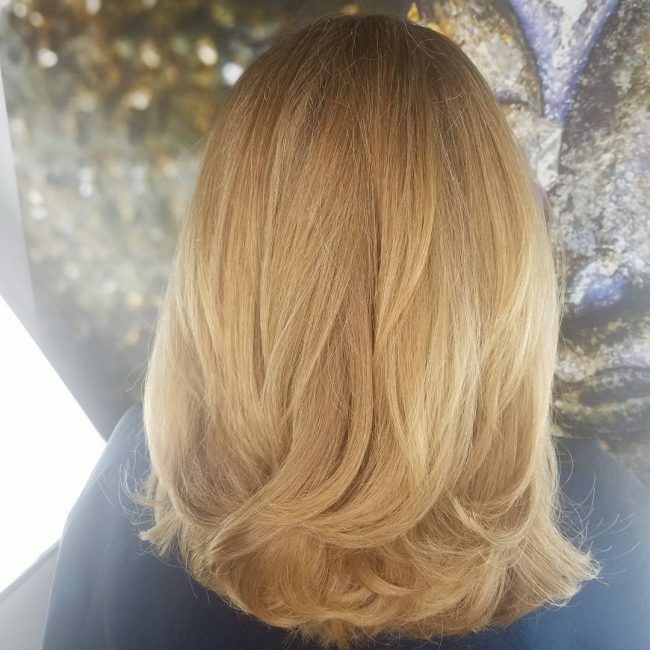 In simple, it means that we can all vote that long hair with some layers is the key to a look that's worth the red carpet. Some women rarely know what they want, and that's not a problem because you have all the help you need here. 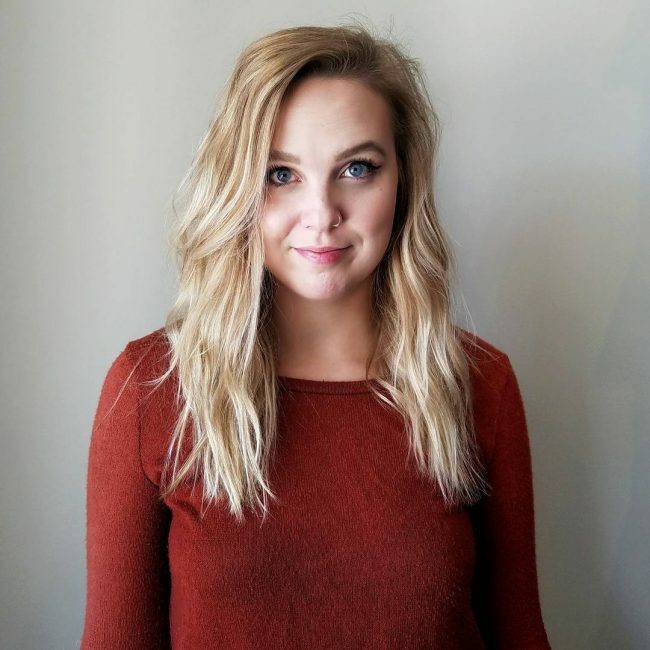 For this fresh fall hair, you're going to keep the terms such as movement, volume, and sassy when talking about this hairdo. You can also mention that long layers start at mid shaft and get gradually longer as you move down to the ends. Surprisingly, any hair with layers be it short or long, such hair creates a fabulous hairstyle. And not for other reasons, it's because layers make any hair look gorgeous not forgetting the little styling effort they require. But that's not all, more fun and glamor lies within the colors. So if you can just go on and color your layers, nobody will stand a chance to beat you in styling. Do you know you can pull out a mysterious look by just combining layers with side bangs? It's very possible. First and foremost, make sure your hair has got some layers. From there, a touch of highlights does some wonders. After all, you're going to need people to turn. So colors bring the eye-catching effect. The last thing will be sweeping your locks to the side to pull out those bangs. 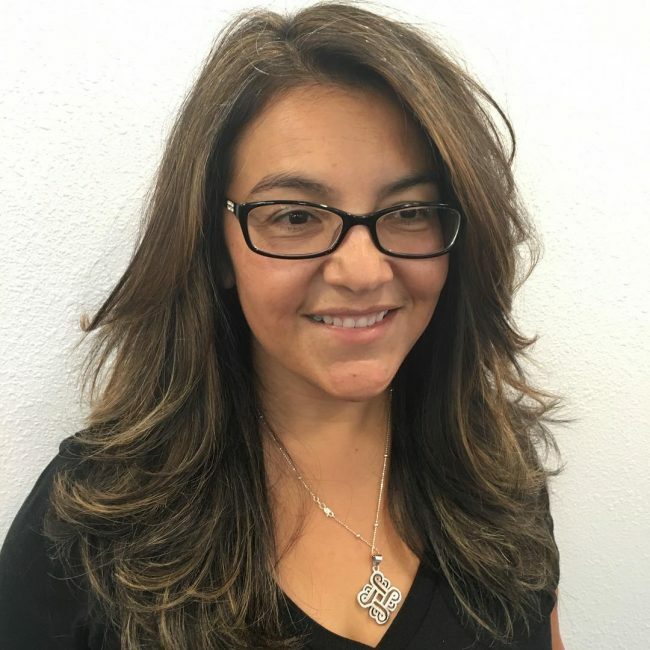 Check out this long hairstyle featuring highlighted layers. This one is an excellent way to thin out your thick or heavy hair. More than that, you'll also be livening up your hair to make it stand out. That's the formula for killing two birds with one stone. You better try it! 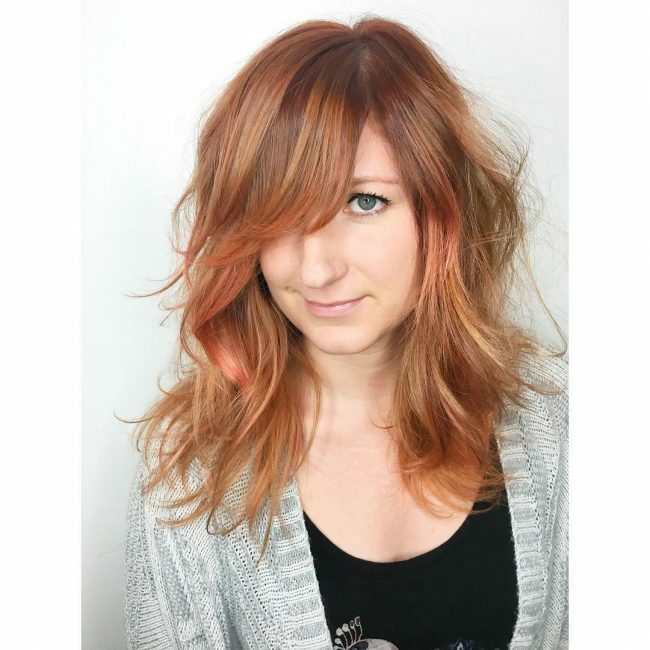 Coloring your long hair with copper tones can be an excellent way in creating some drama. 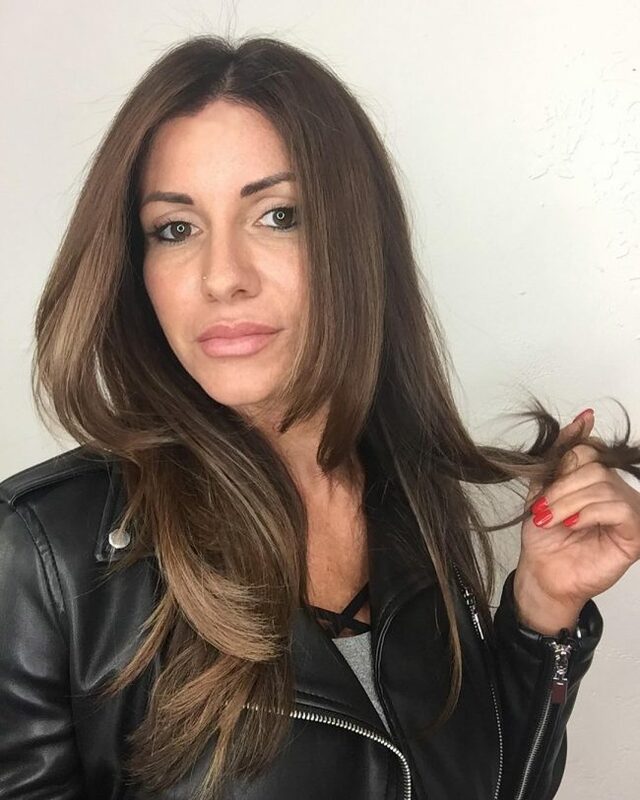 Other opinions reveal that you can use a darker tone on the roots and a lighter one on the ends to break super long locks. All the same, we all agree that no matter what you use the color for, you layered locks will have a captivating look. And this one will stop any traffic when you walk on the streets. You try taking it to a dance party, and it will sweep the entire floor. Also, it's a layered masterpiece to showcase the different lengths of your locks. Very few hairstyles that can manage to pull out the effects that come with this one. And to surprise you, it's effortless and easier to maintain. Are you now confused on which one to take? That's fine; it's one way of testing whether you're deep into the trend. But it's because all of these long layered hairstyles are chic and classic. You can decide to look at them again and settle on one. If you still you can't decide, try pointing with your eyes closed.